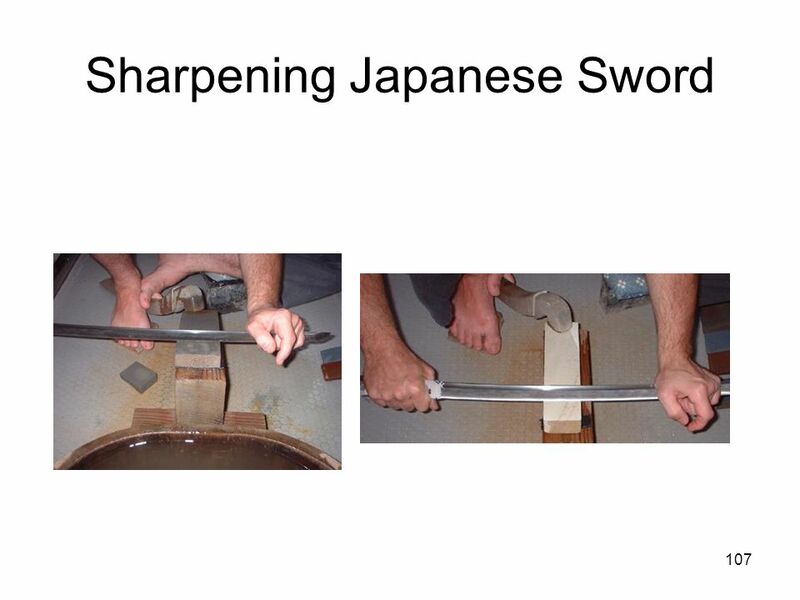 2 Infections can be deadly! 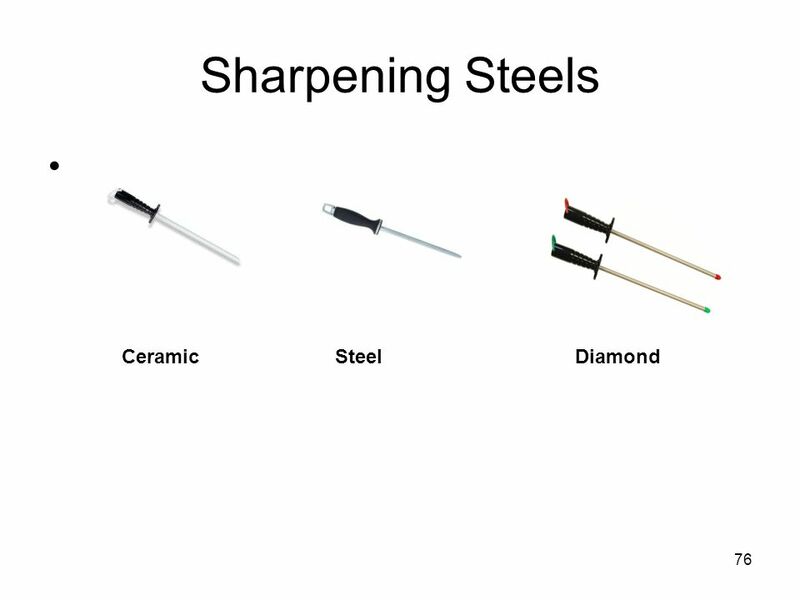 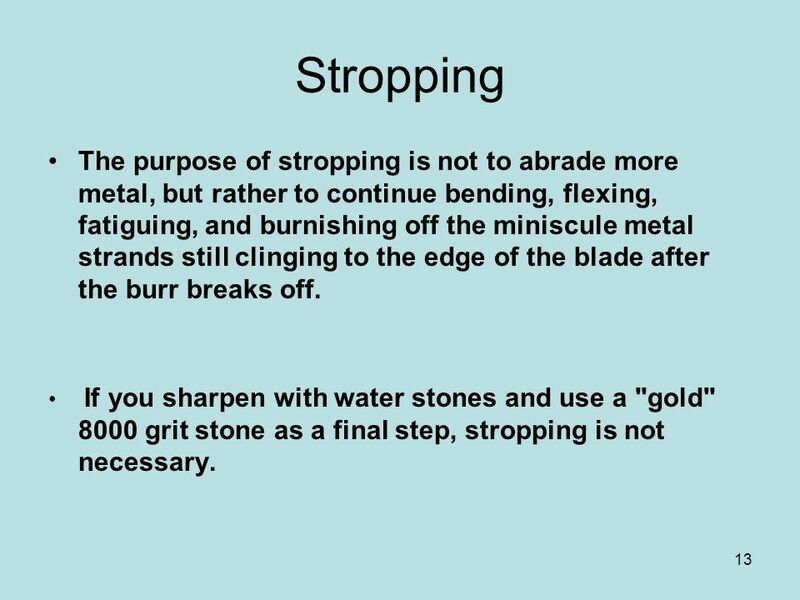 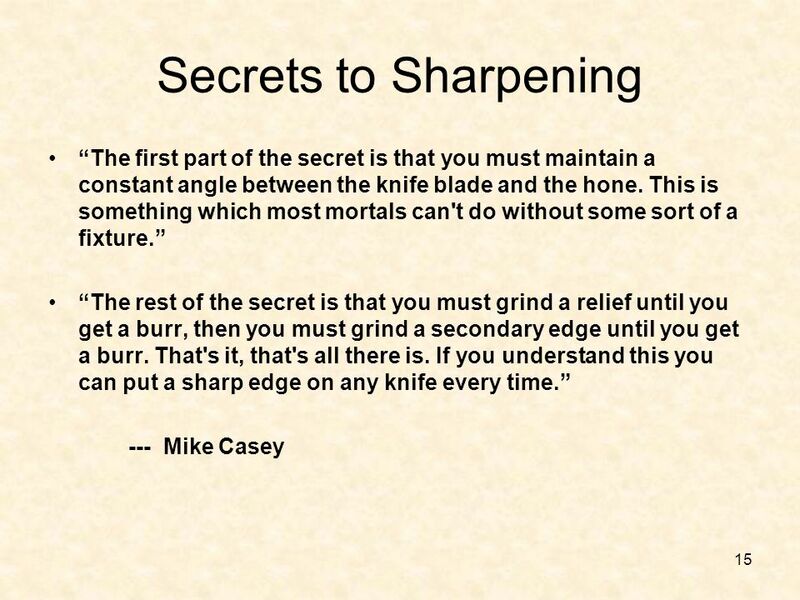 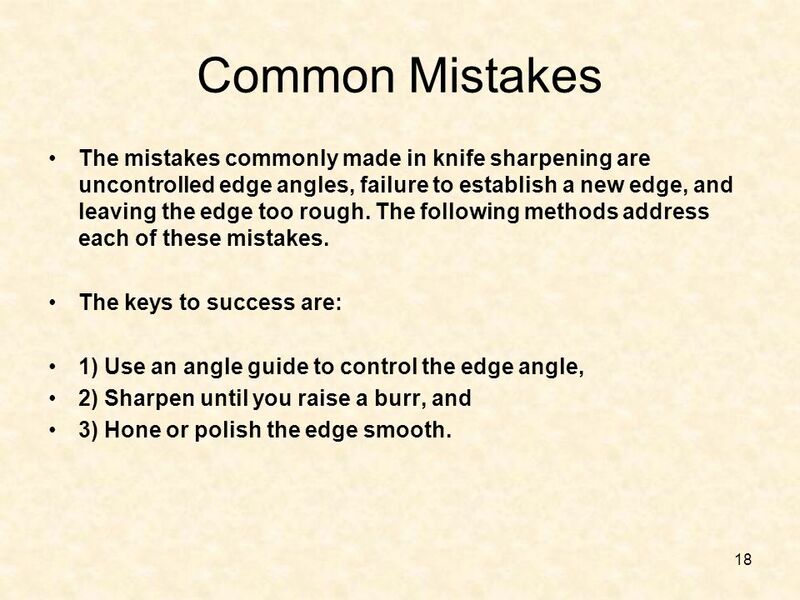 Sharpening 101 Don’t Cut Yourself !! 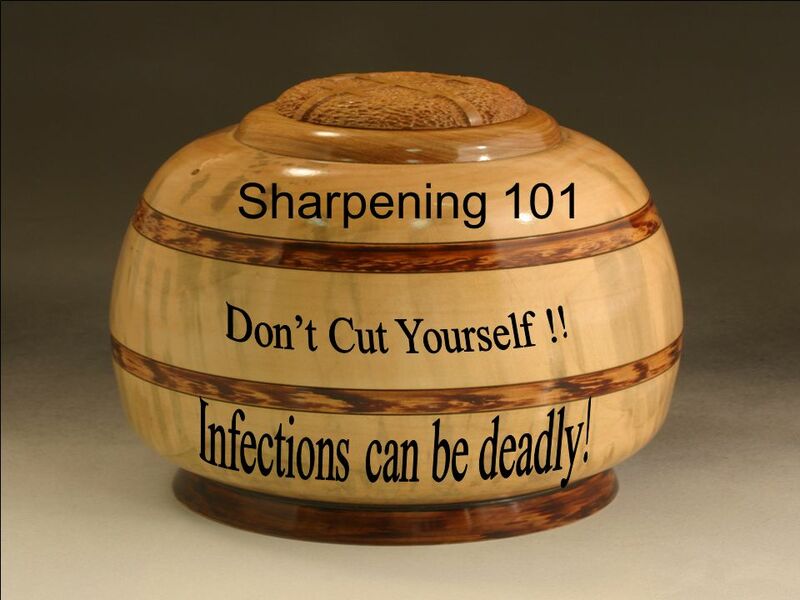 Infections can be deadly! 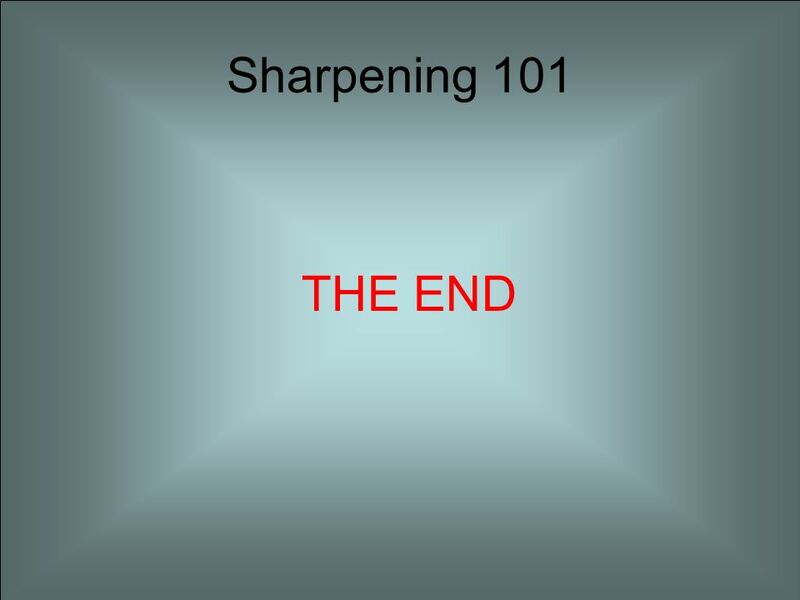 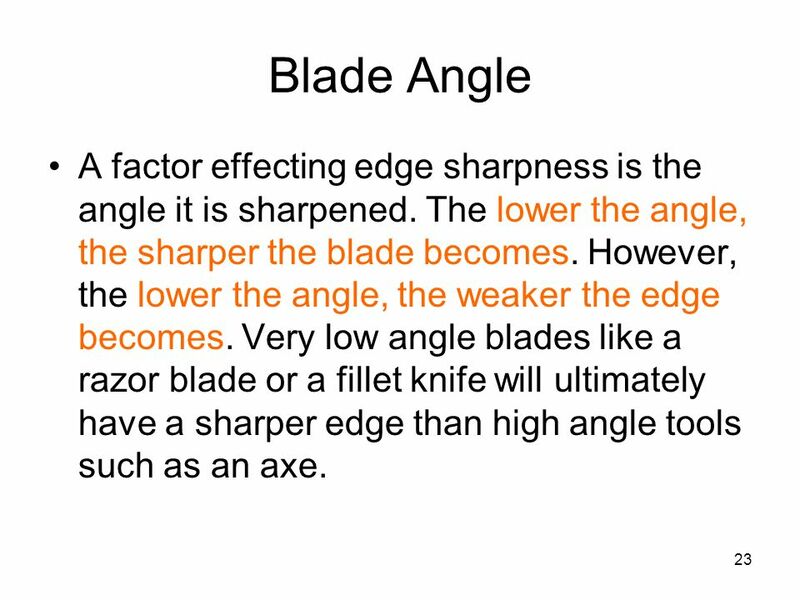 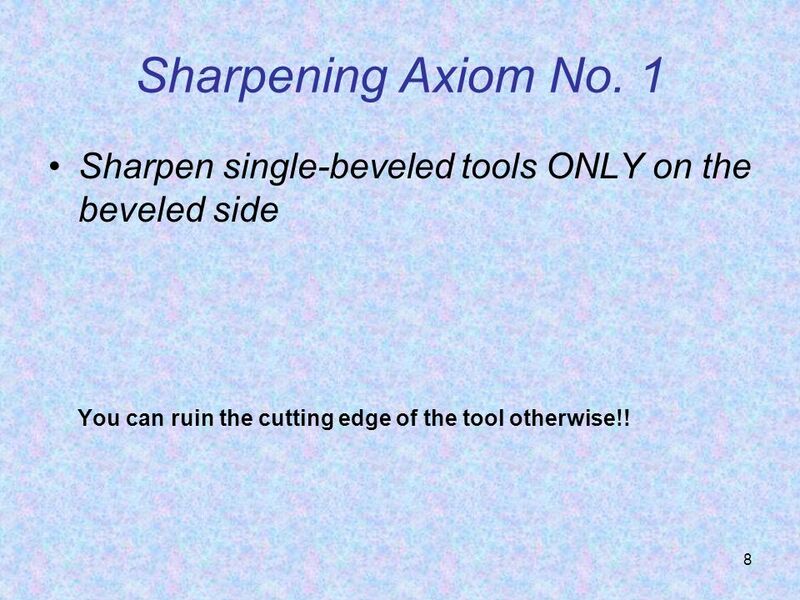 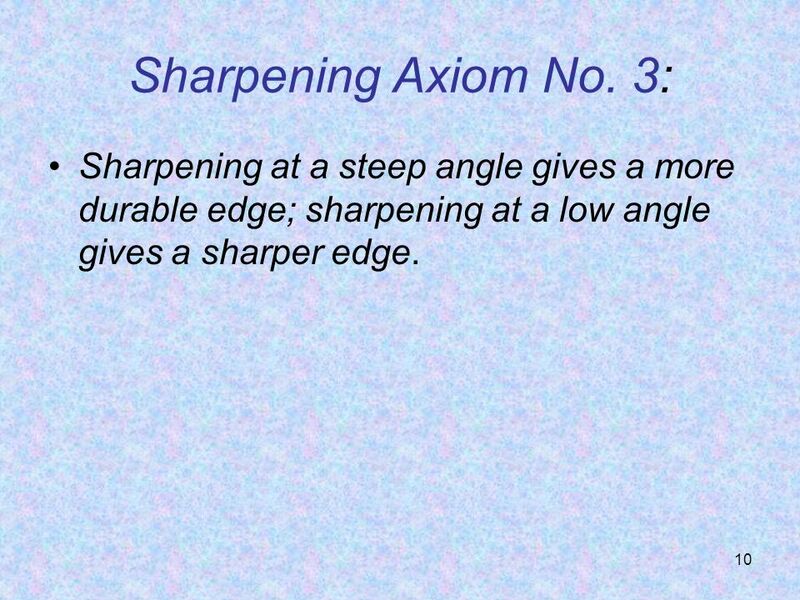 11 Sharpening Axiom No. 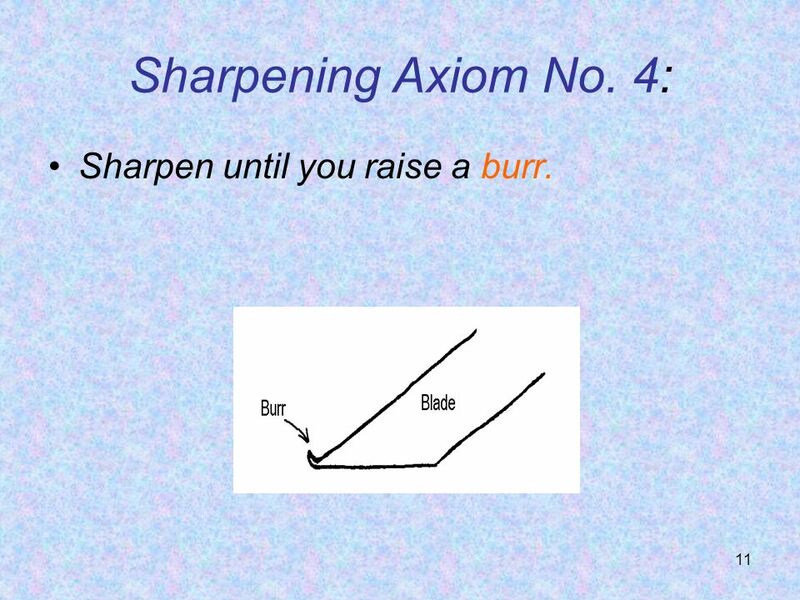 4: Sharpen until you raise a burr. 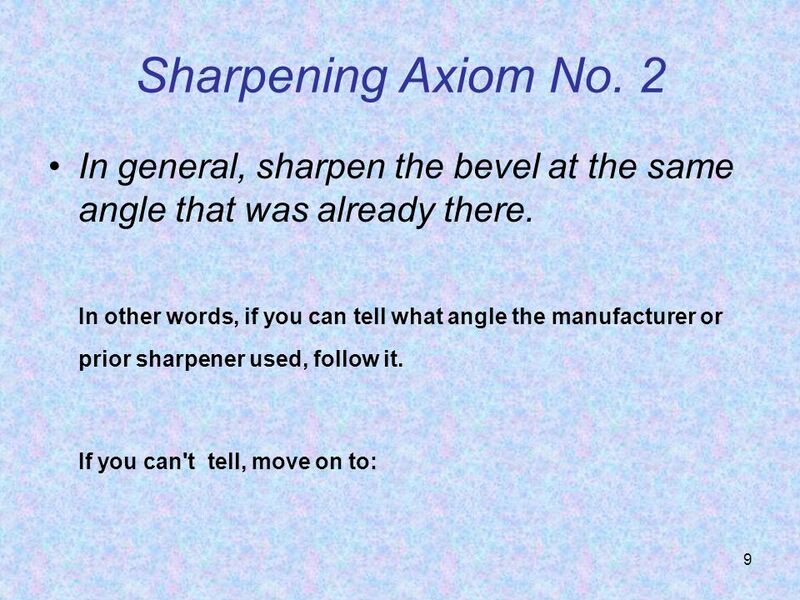 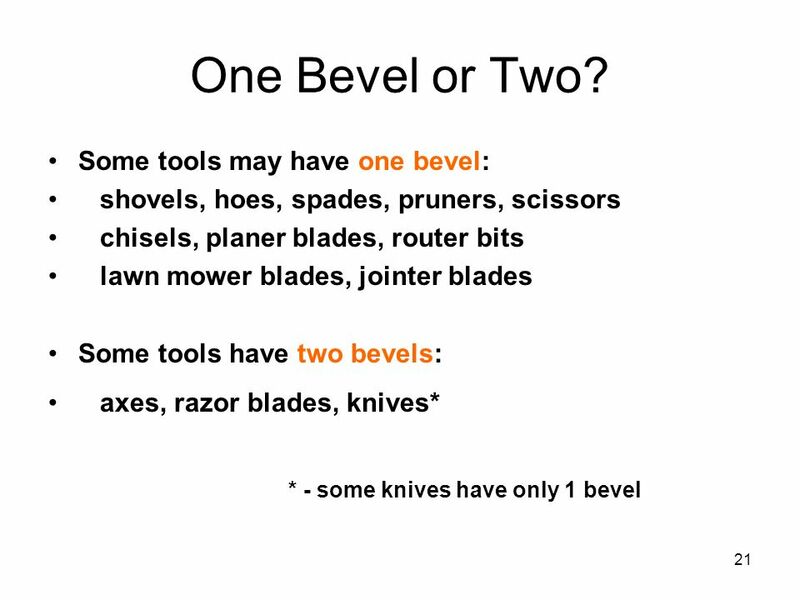 12 Sharpening Axiom No. 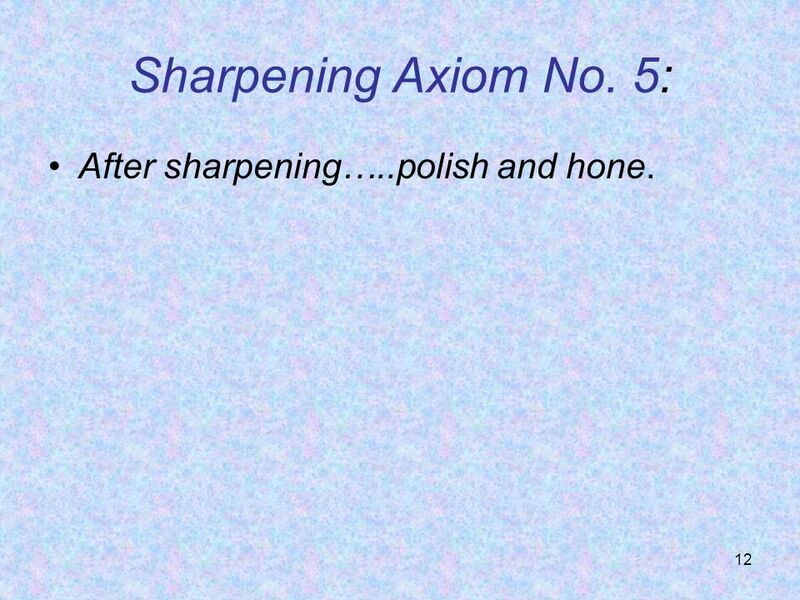 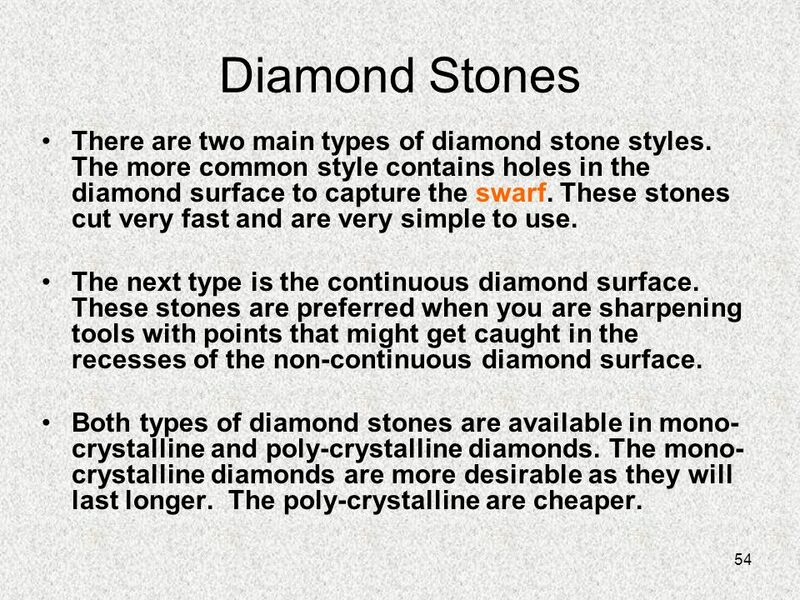 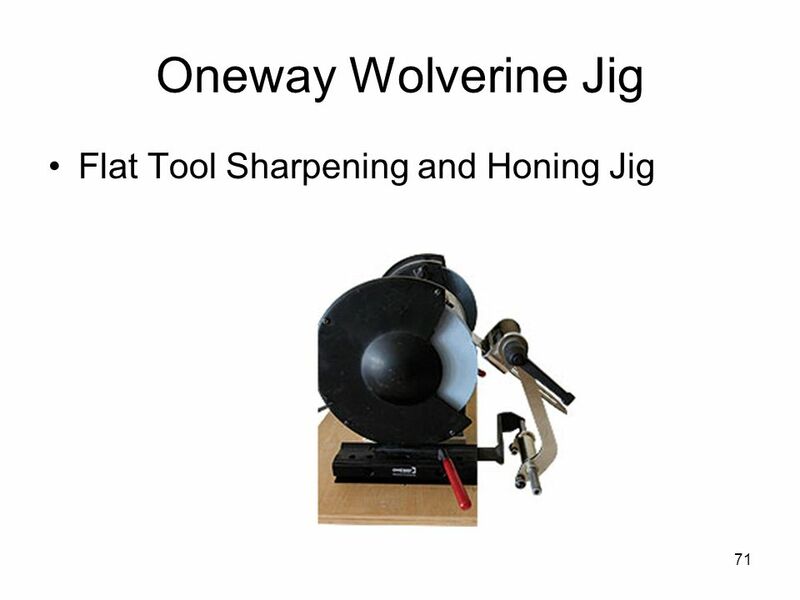 5: After sharpening…..polish and hone. 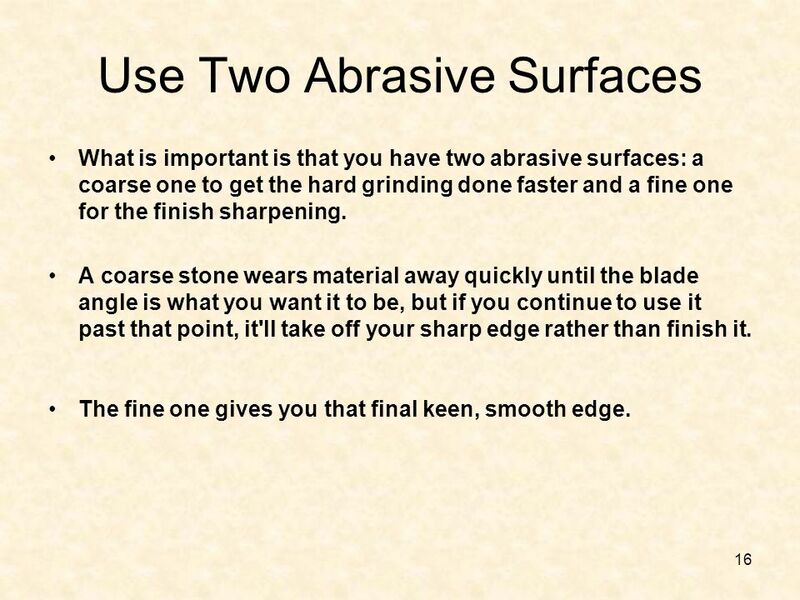 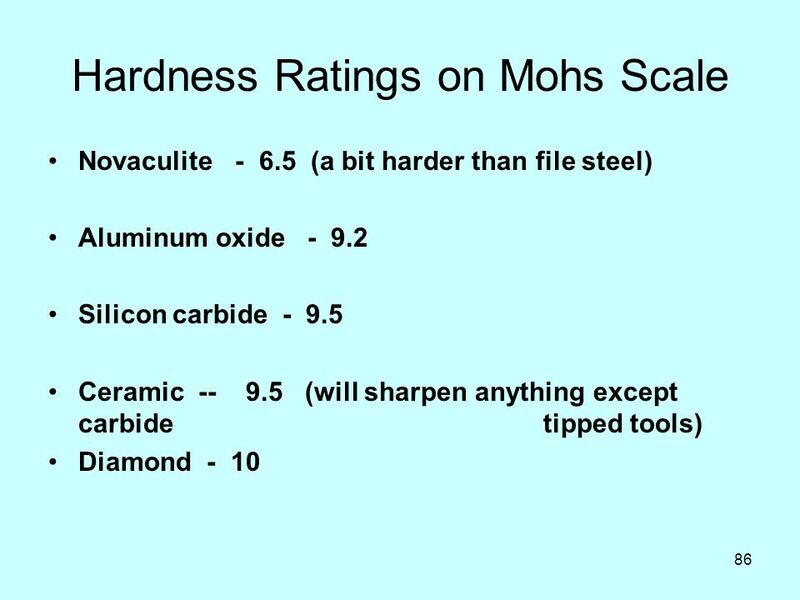 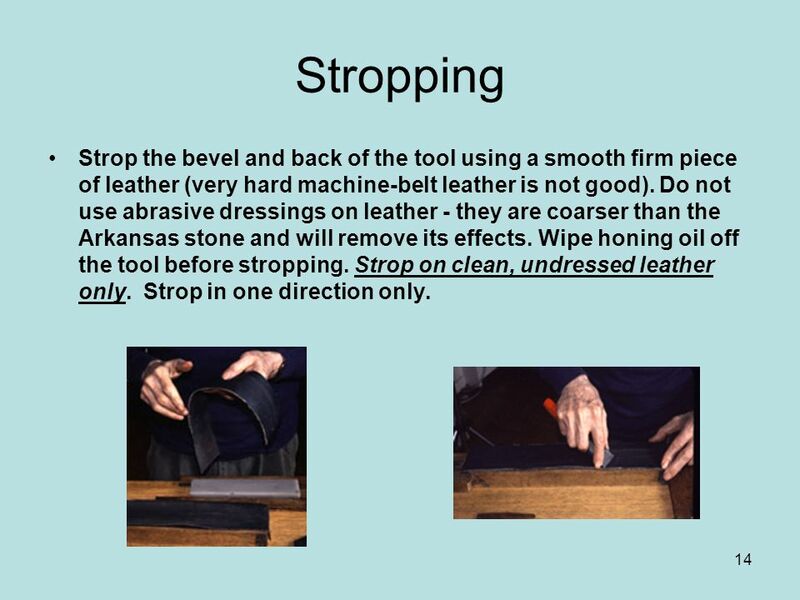 17 Common Error The most common error in using abrasives is not starting with a sufficiently coarse grit to efficiently do the necessary material removal to prepare the tool for sharpening. 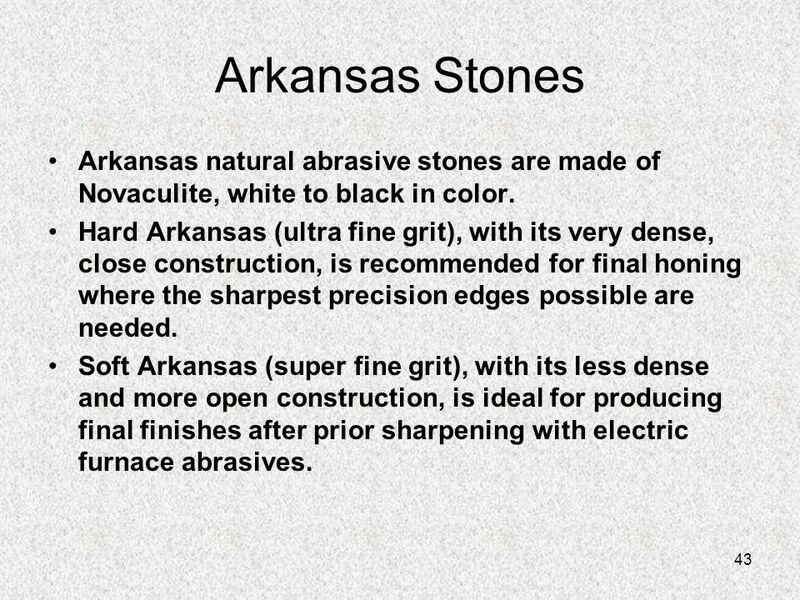 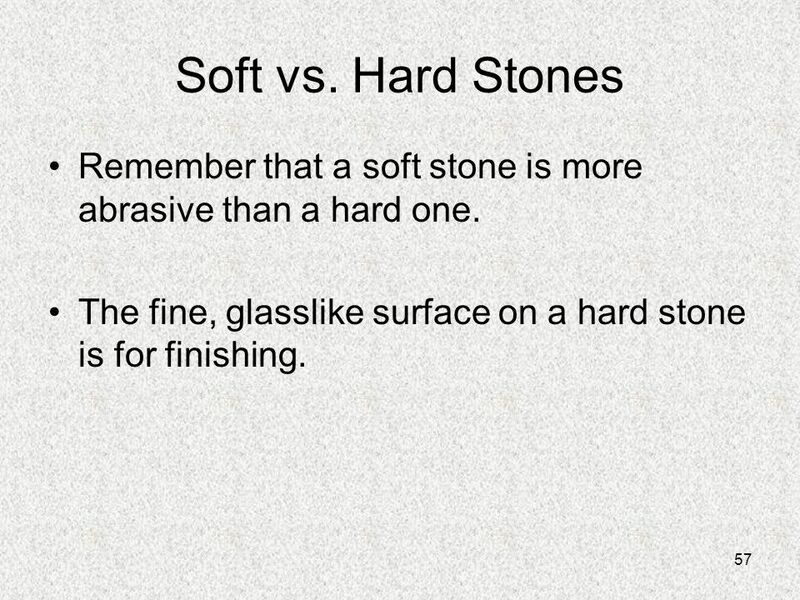 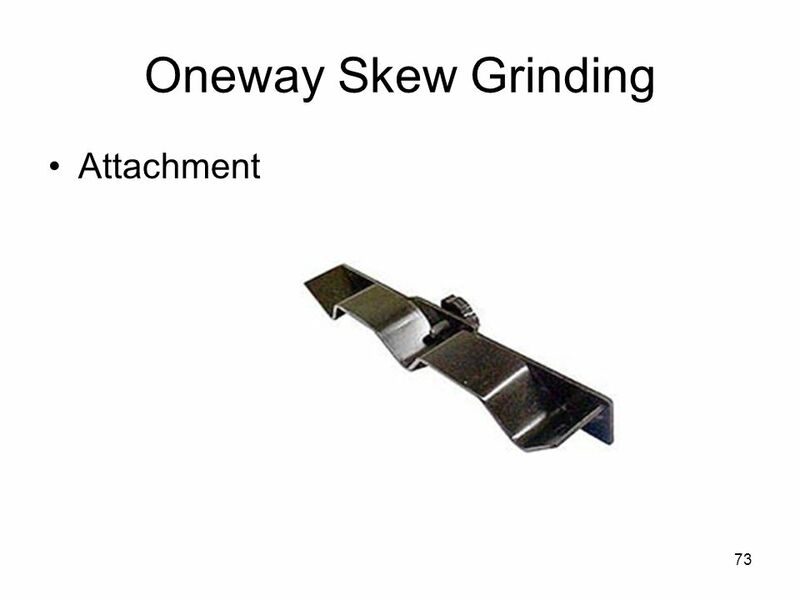 This grit must do all the necessary shaping or flattening and edge defect removal. 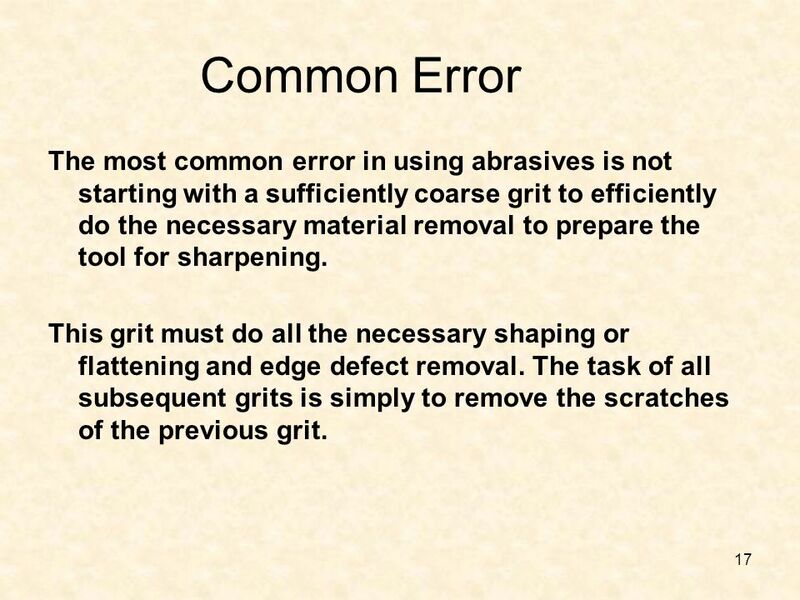 The task of all subsequent grits is simply to remove the scratches of the previous grit. 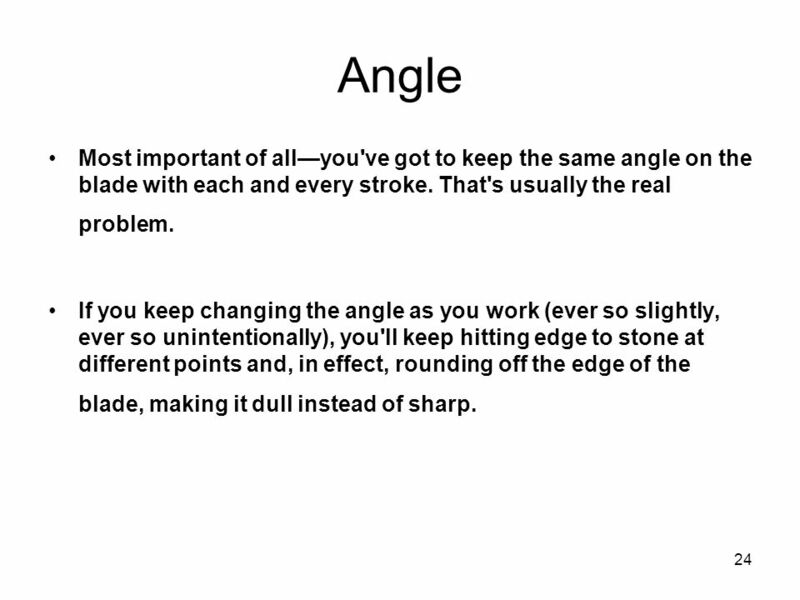 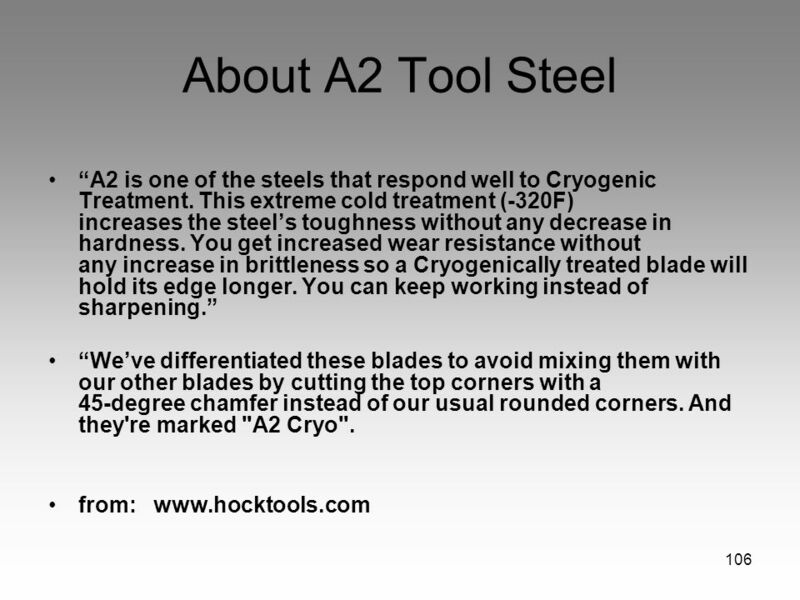 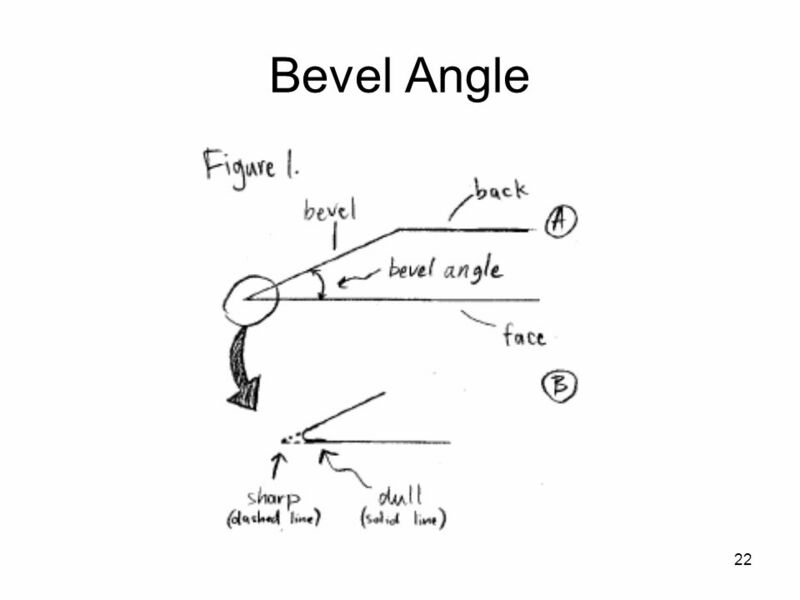 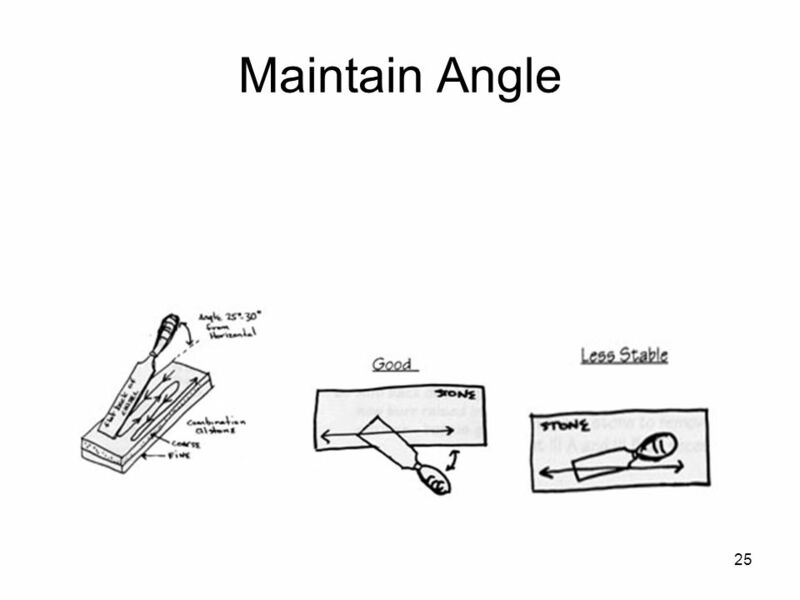 24 Angle Most important of all—you've got to keep the same angle on the blade with each and every stroke. 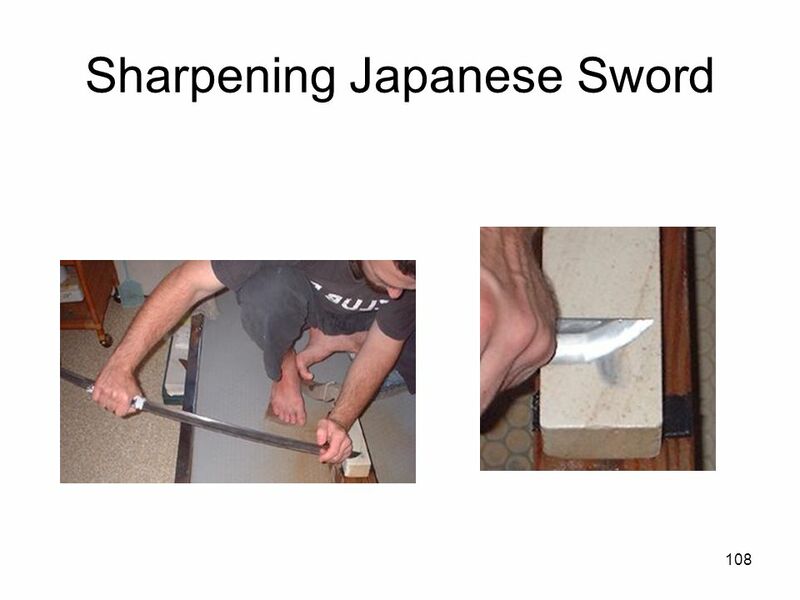 That's usually the real problem. 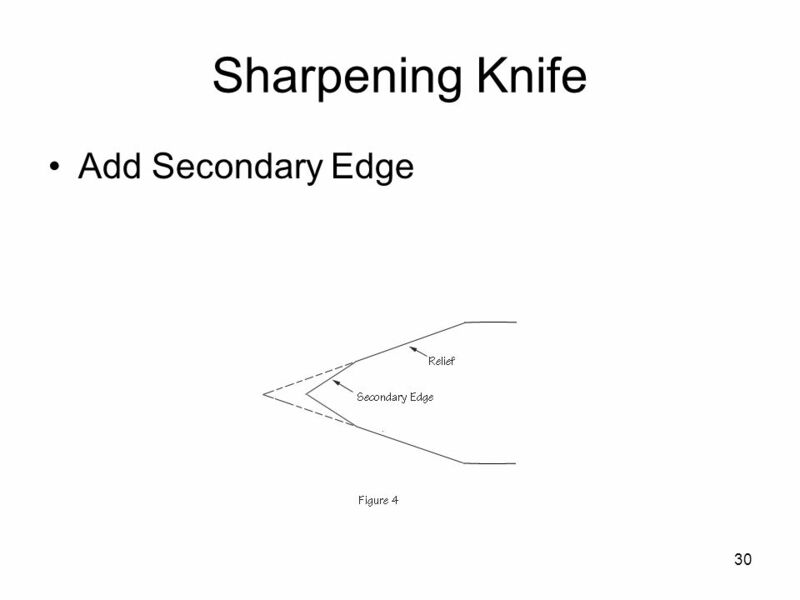 If you keep changing the angle as you work (ever so slightly, ever so unintentionally), you'll keep hitting edge to stone at different points and, in effect, rounding off the edge of the blade, making it dull instead of sharp. 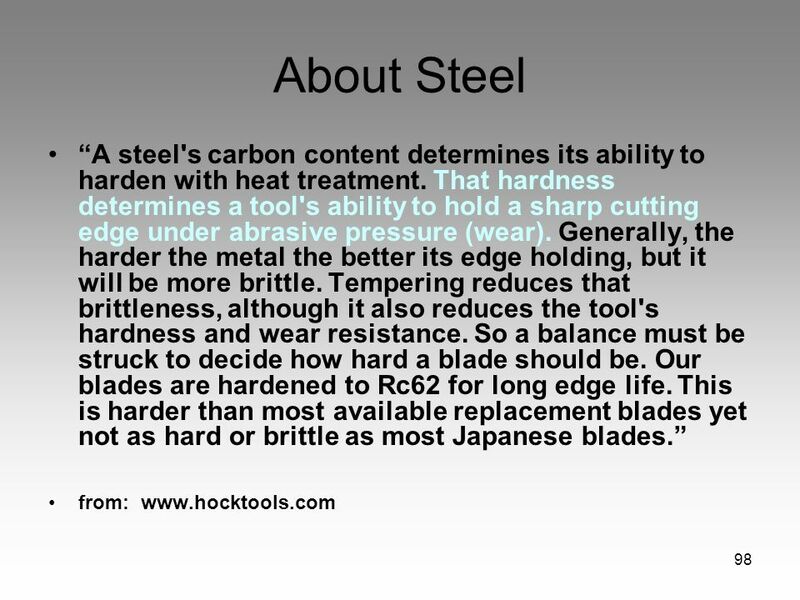 Semi-Hollow - Creates a nice balance between a sharp edge and overall blade strength. 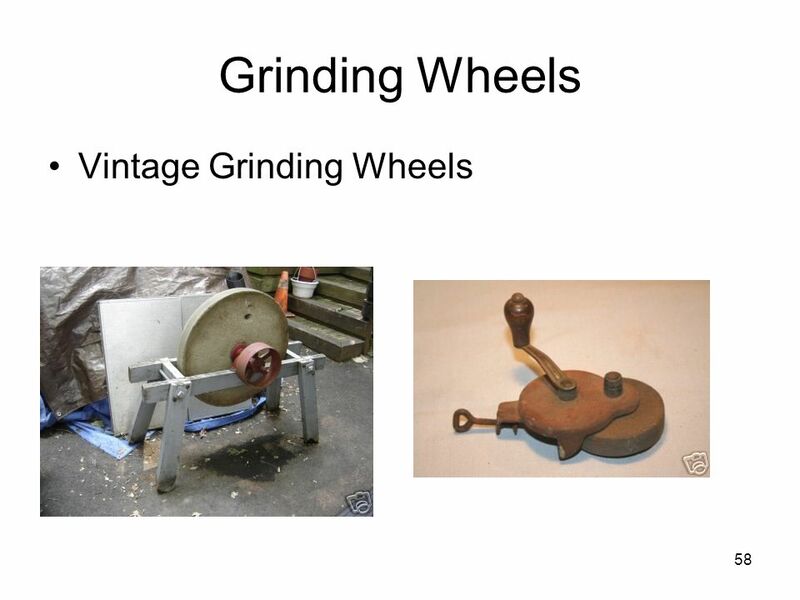 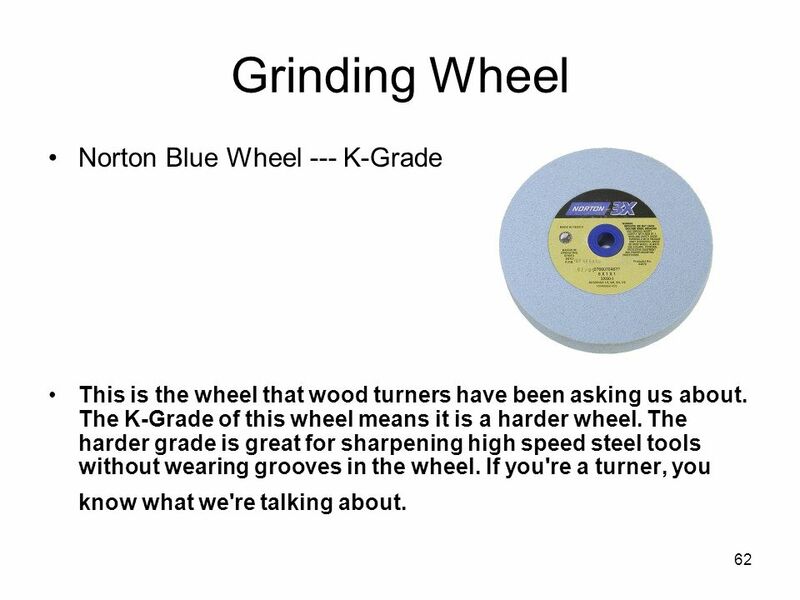 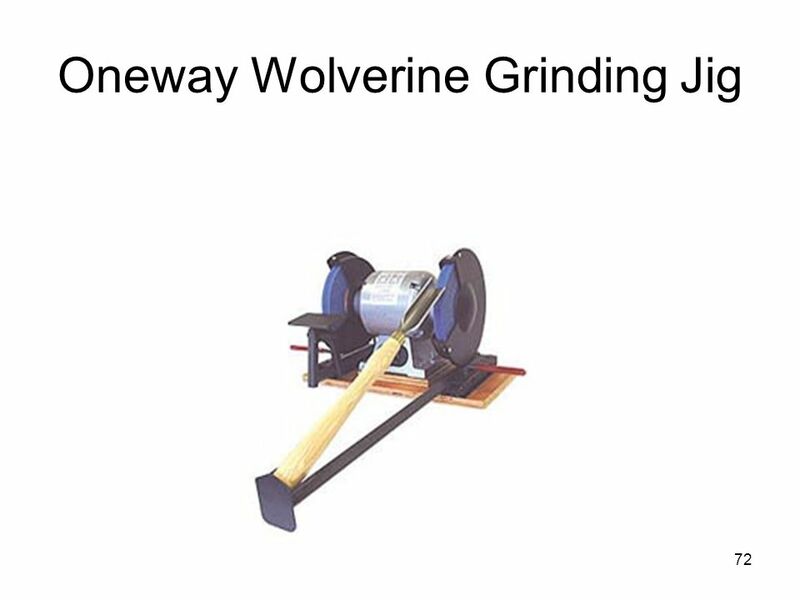 It is the most common grind used today. 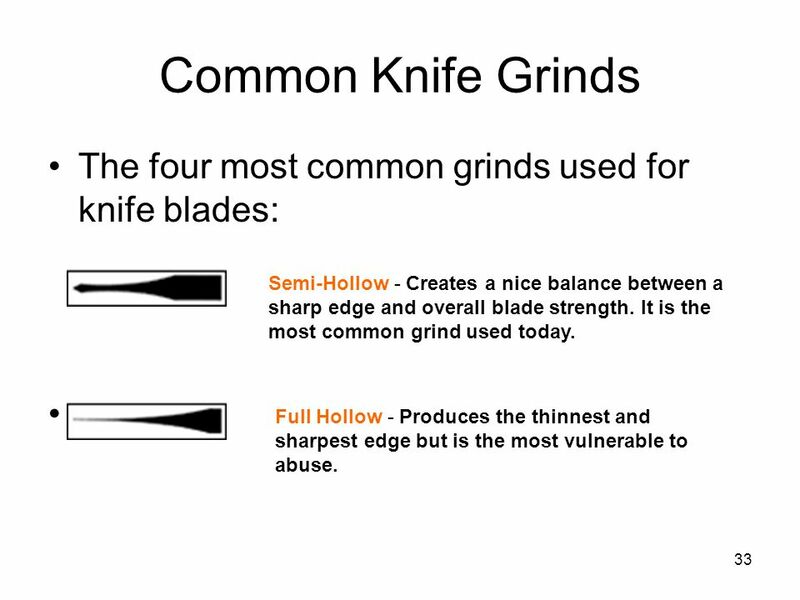 From: Buckknives.com Full Hollow - Produces the thinnest and sharpest edge but is the most vulnerable to abuse. 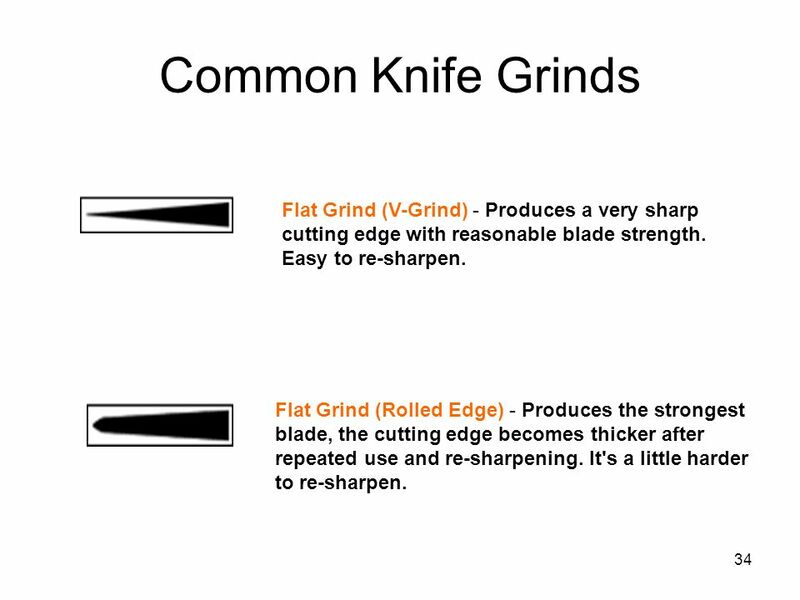 34 Common Knife Grinds Flat Grind (V-Grind) - Produces a very sharp cutting edge with reasonable blade strength. 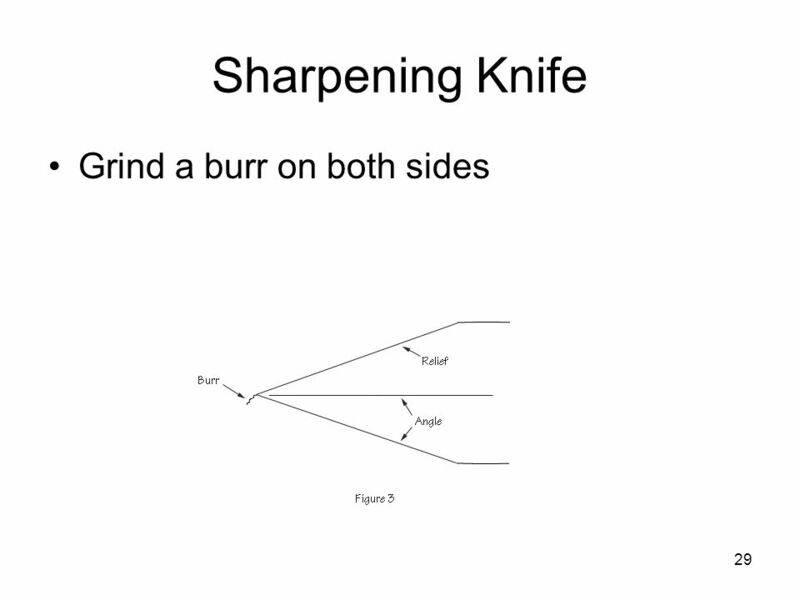 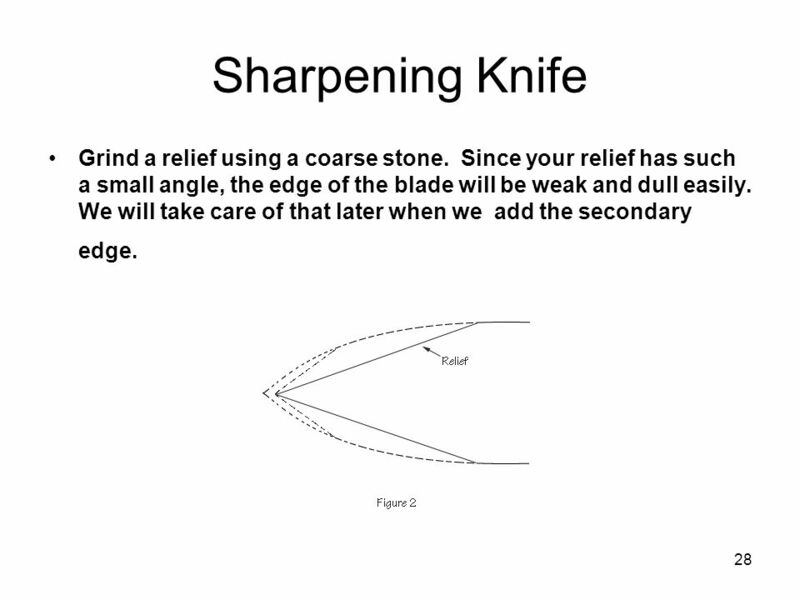 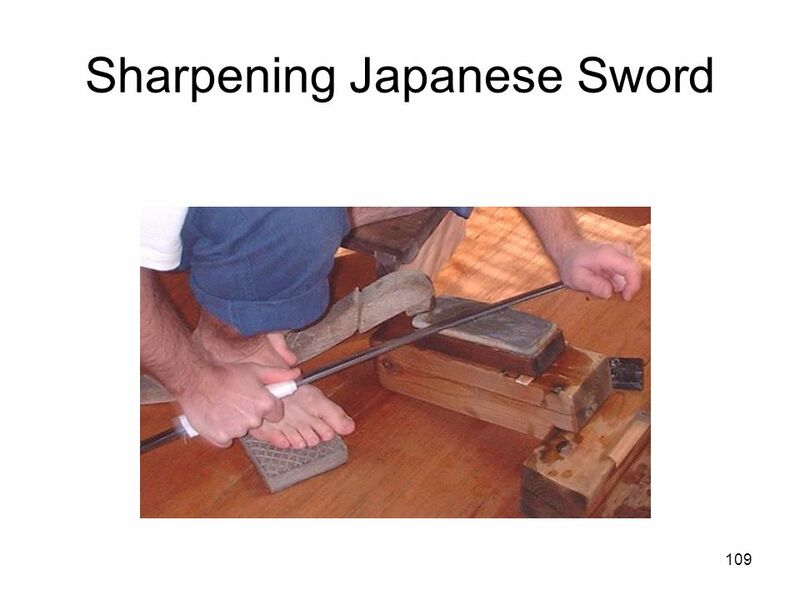 Easy to re-sharpen. 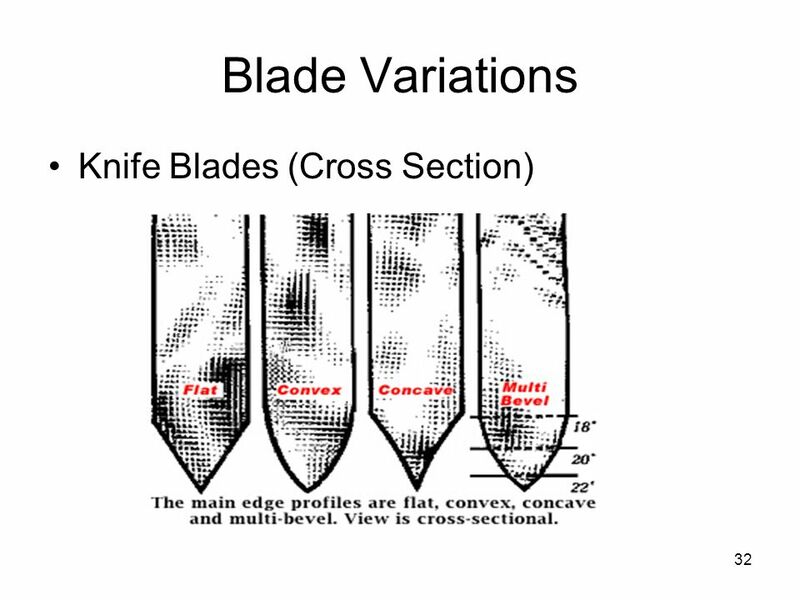 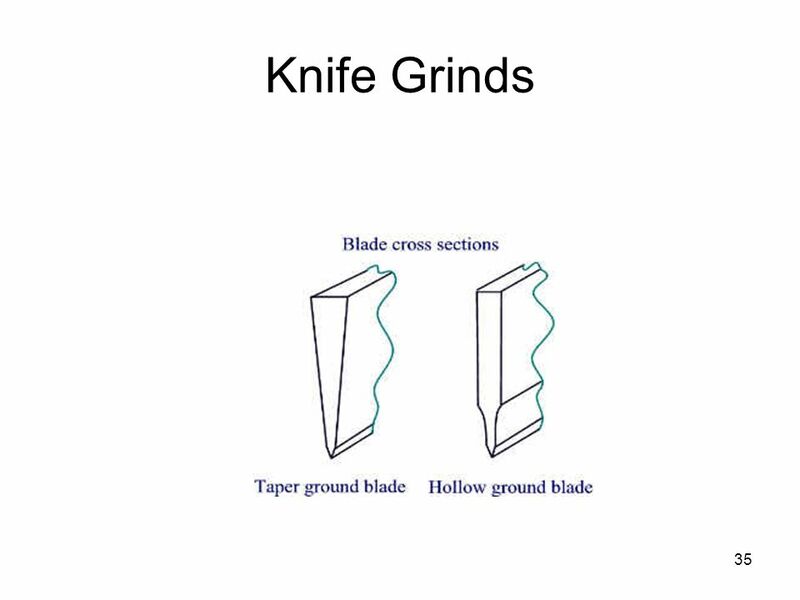 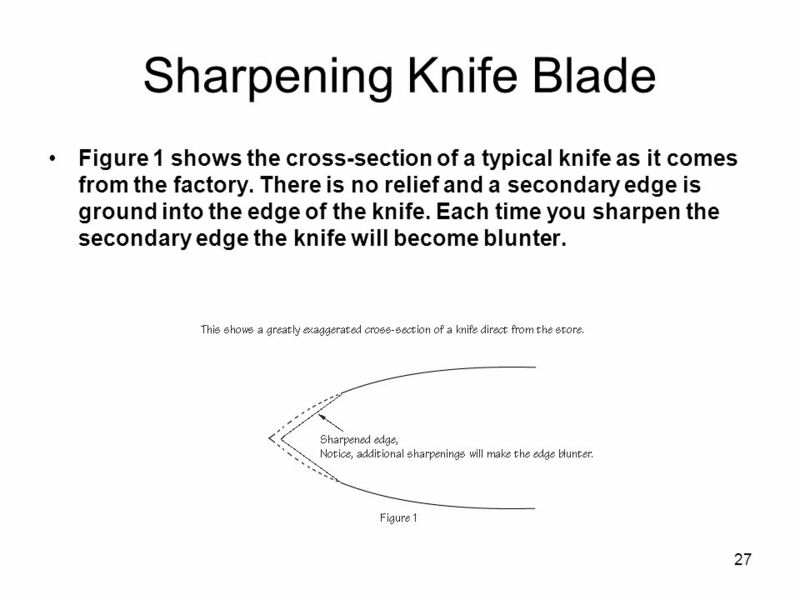 From: buckknives.com Flat Grind (Rolled Edge) - Produces the strongest blade, the cutting edge becomes thicker after repeated use and re-sharpening. 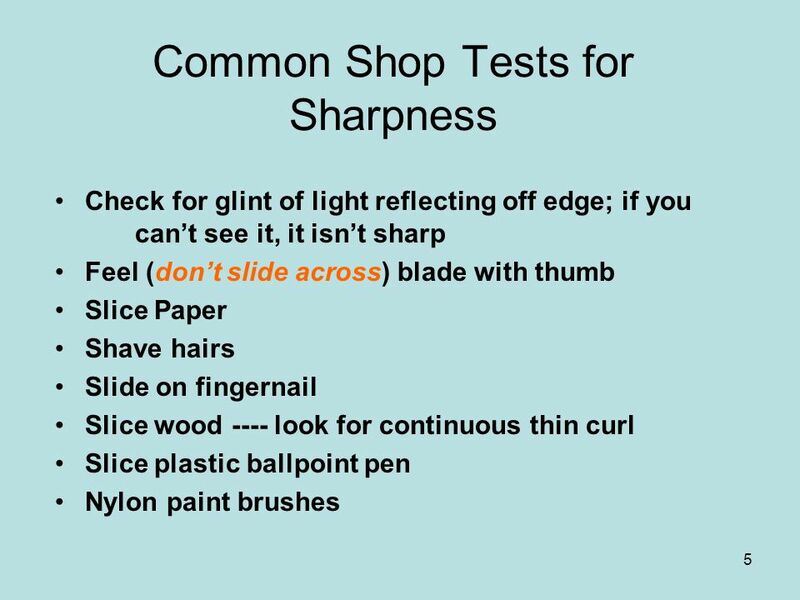 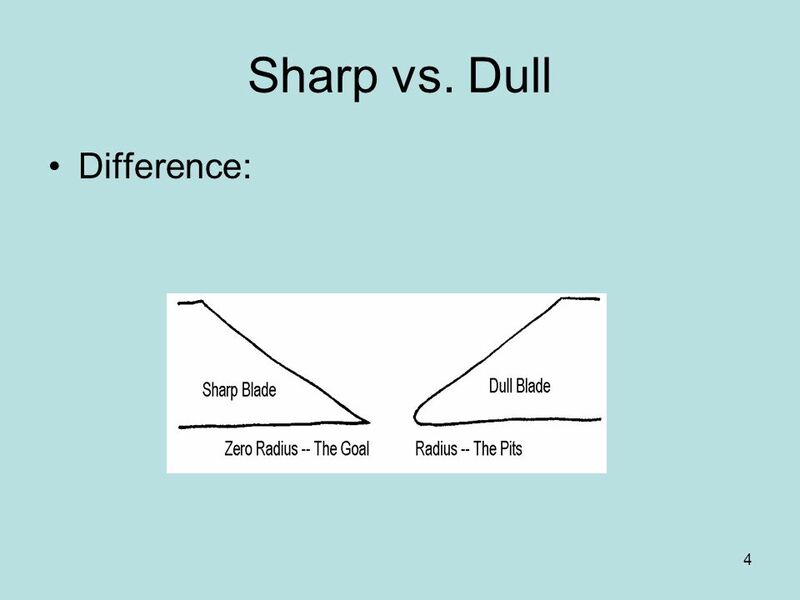 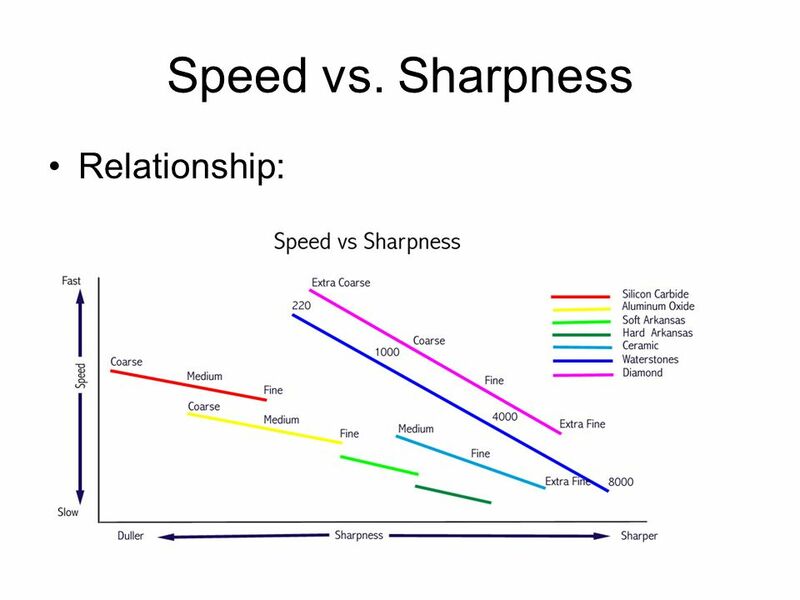 It's a little harder to re-sharpen. 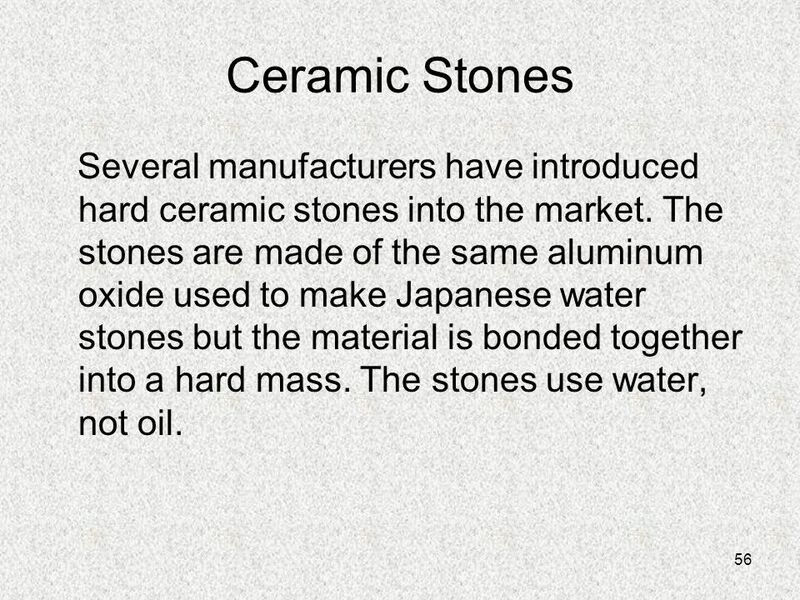 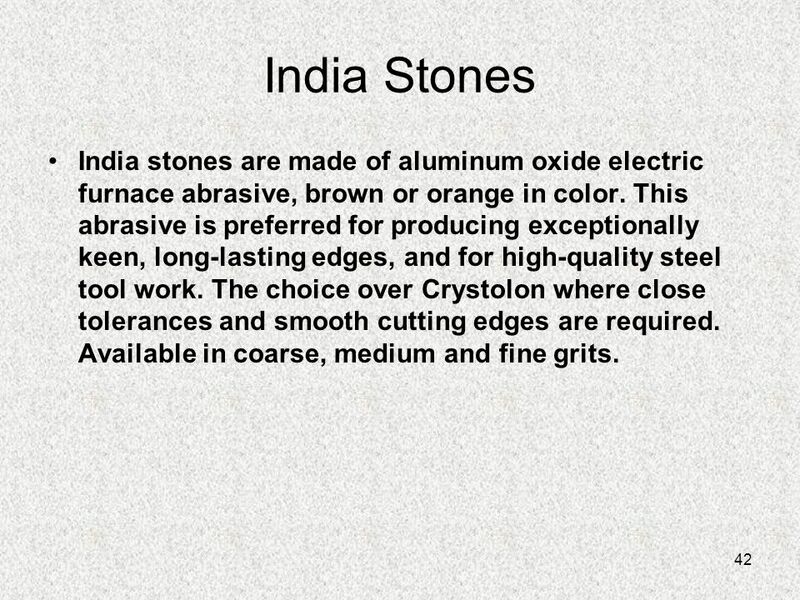 56 Ceramic Stones Several manufacturers have introduced hard ceramic stones into the market. 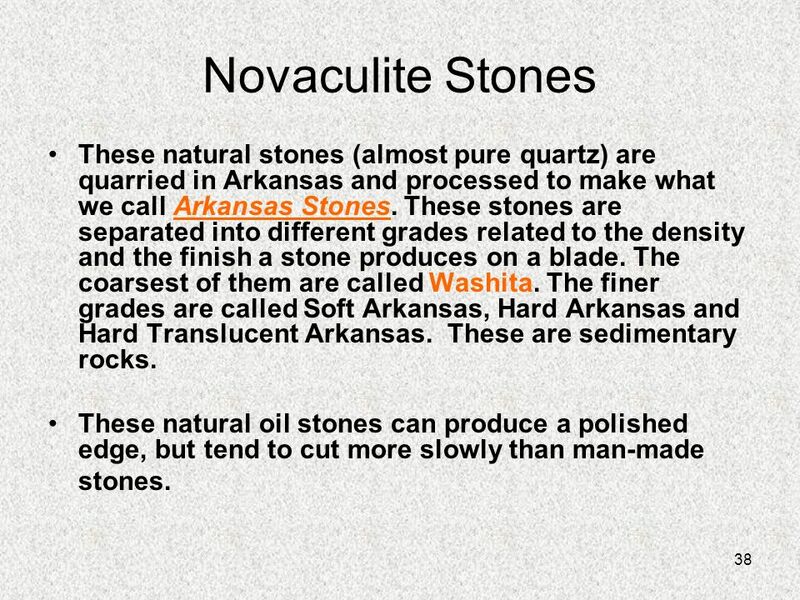 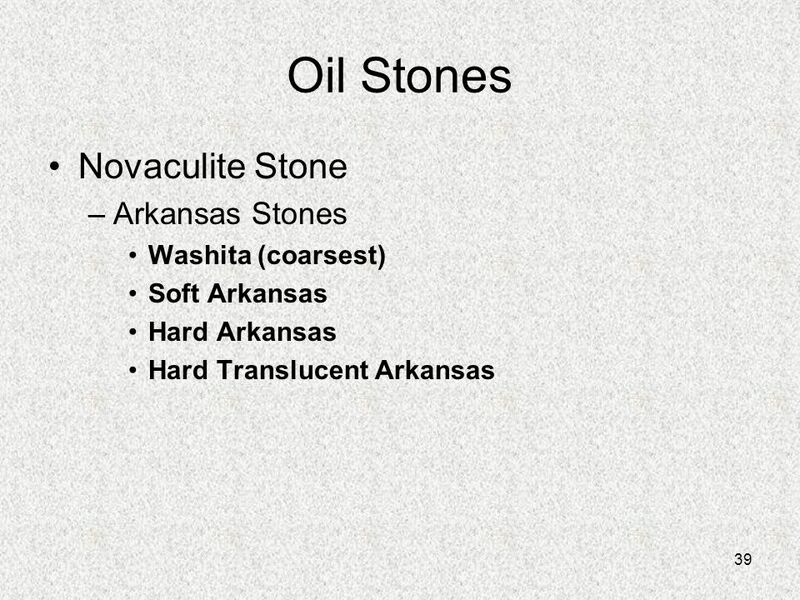 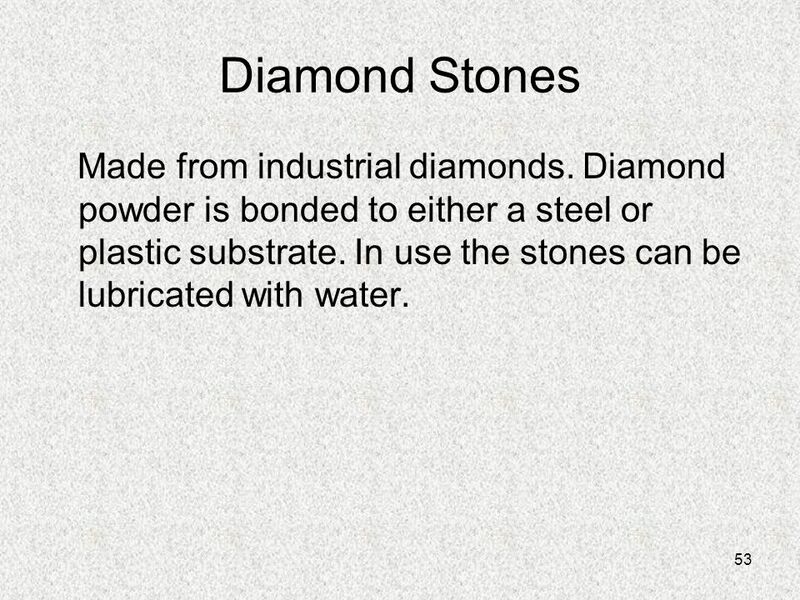 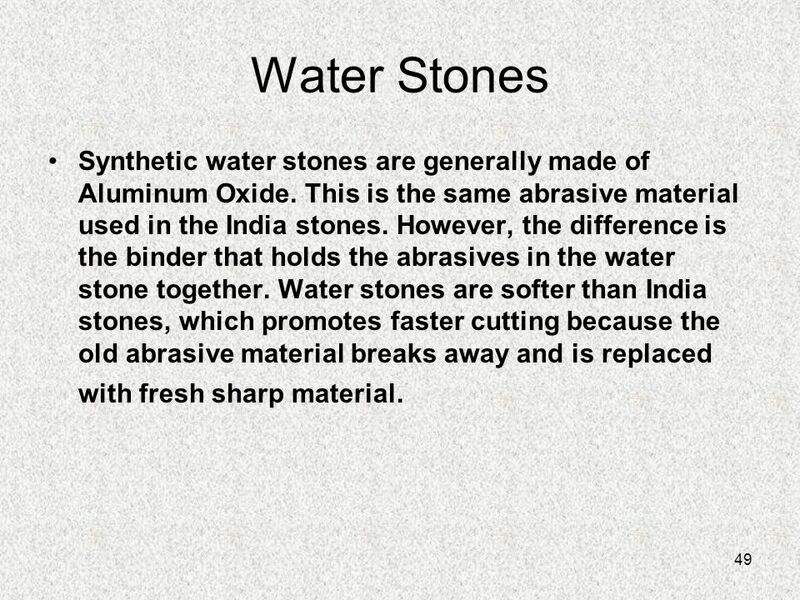 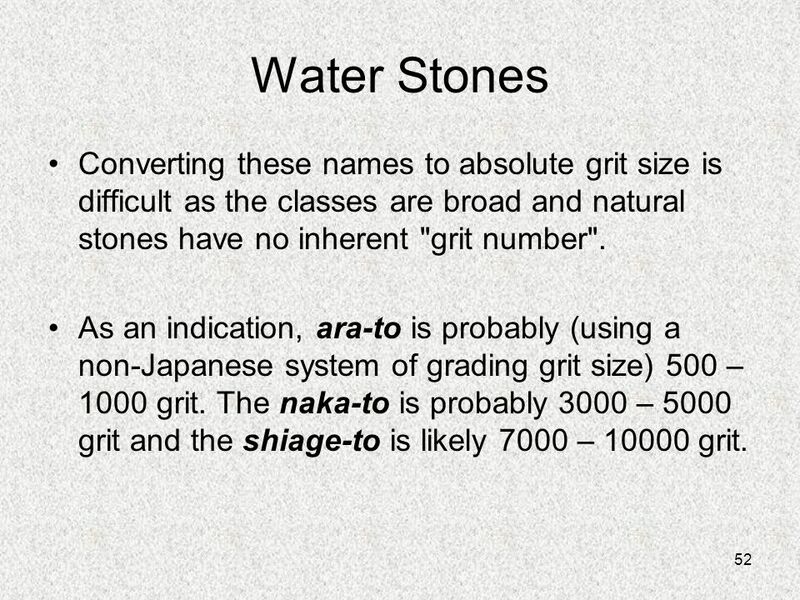 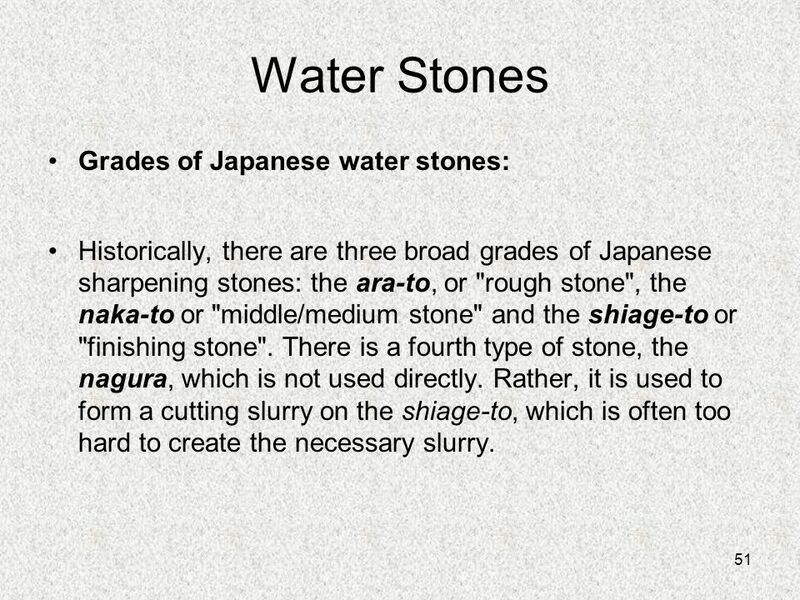 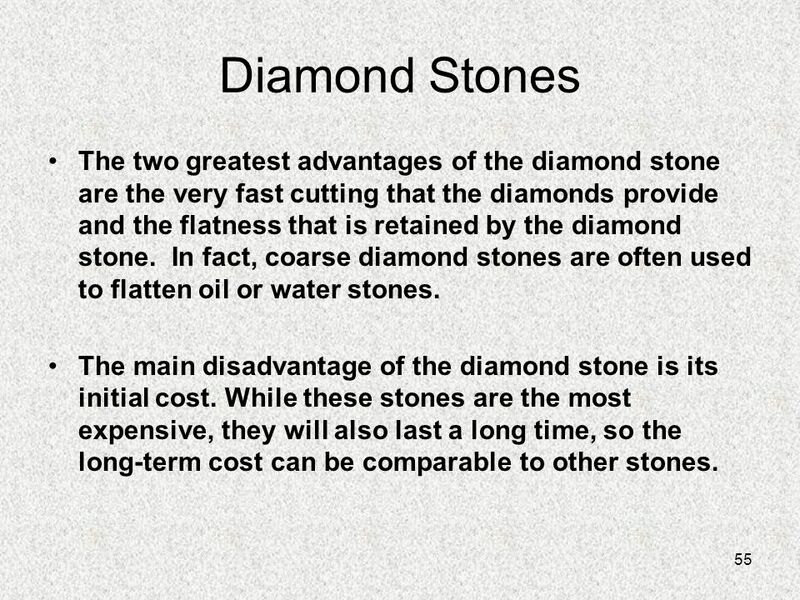 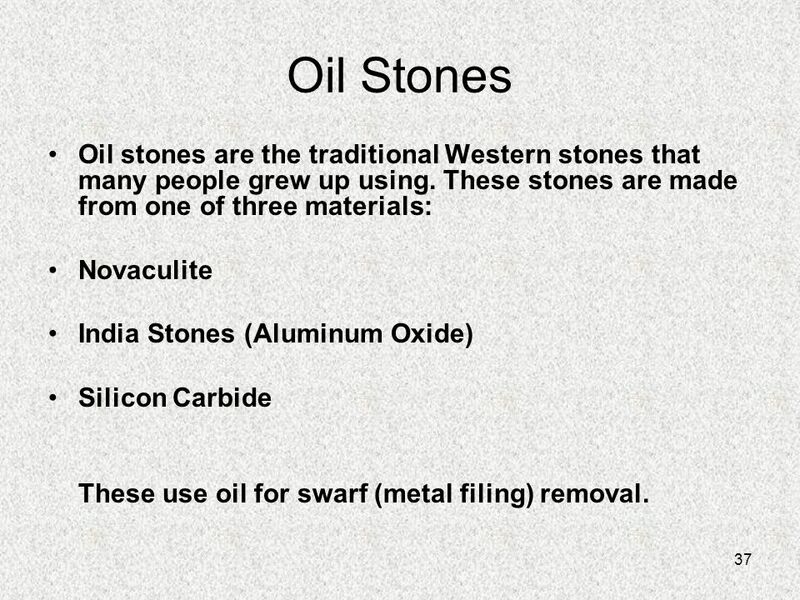 The stones are made of the same aluminum oxide used to make Japanese water stones but the material is bonded together into a hard mass. 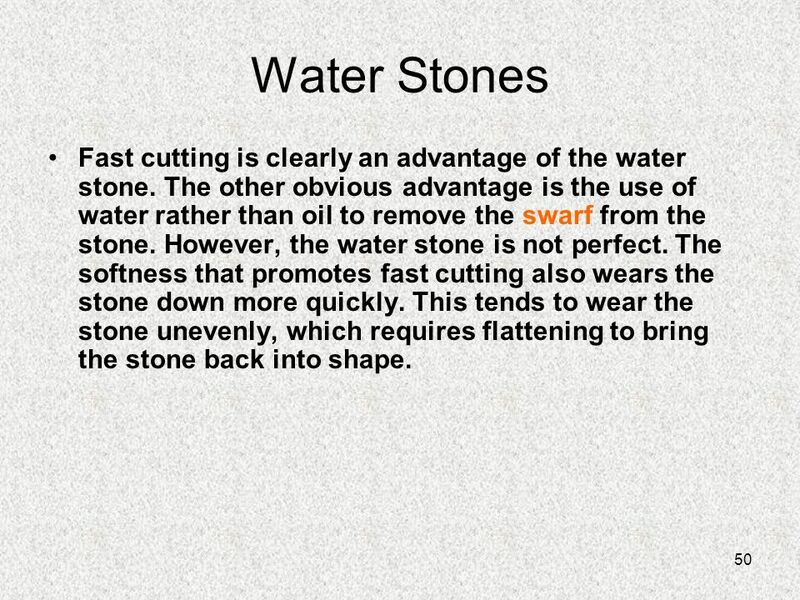 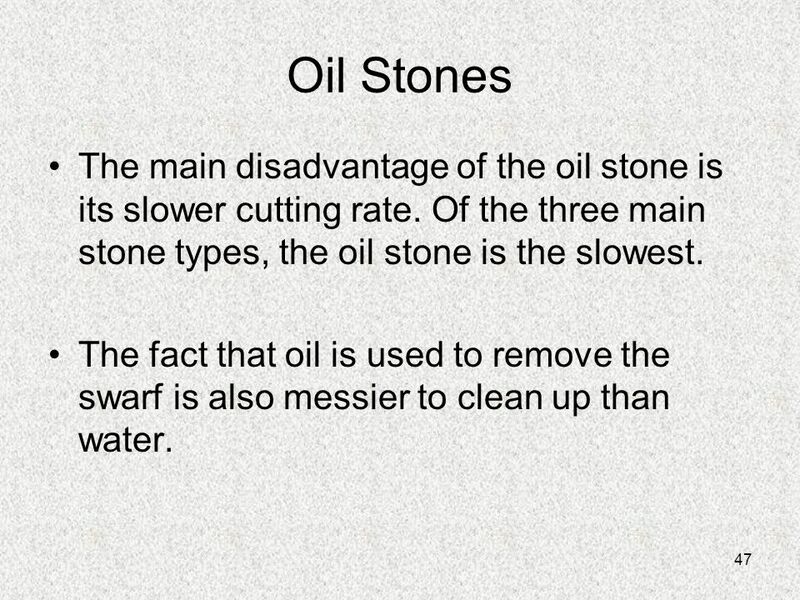 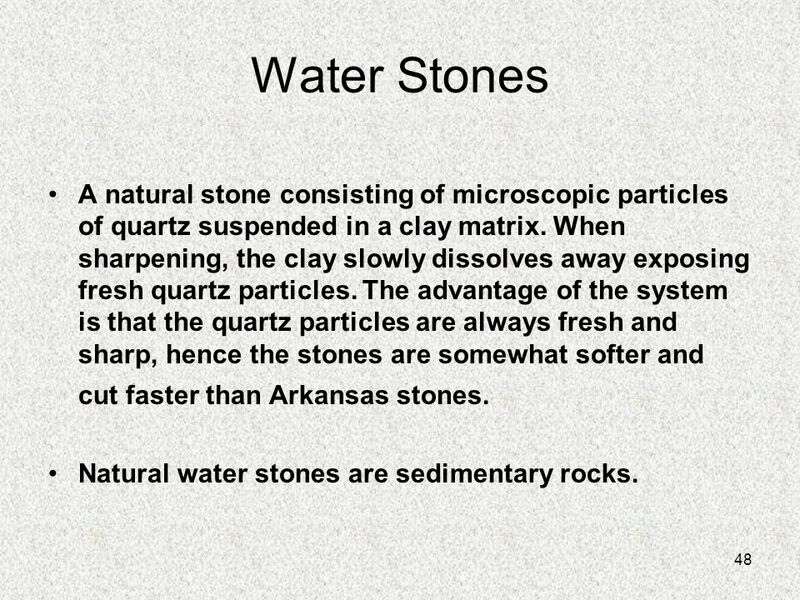 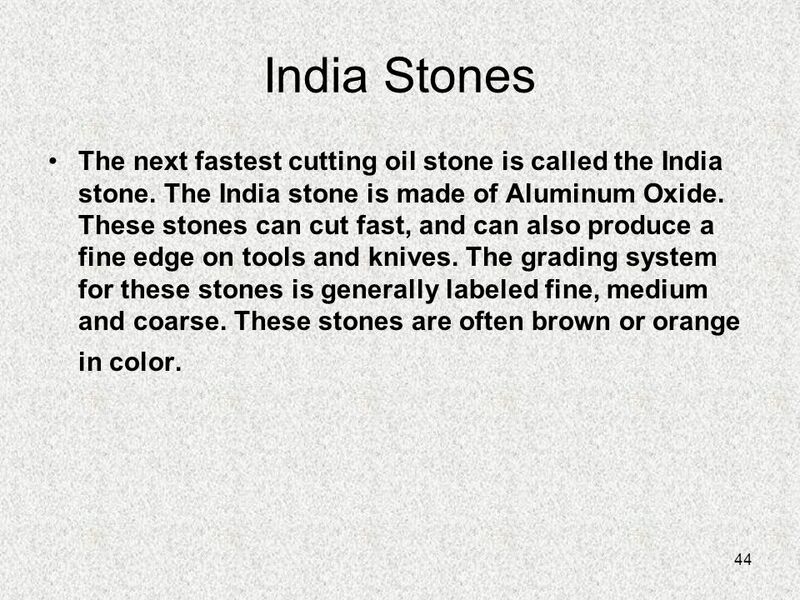 The stones use water, not oil. 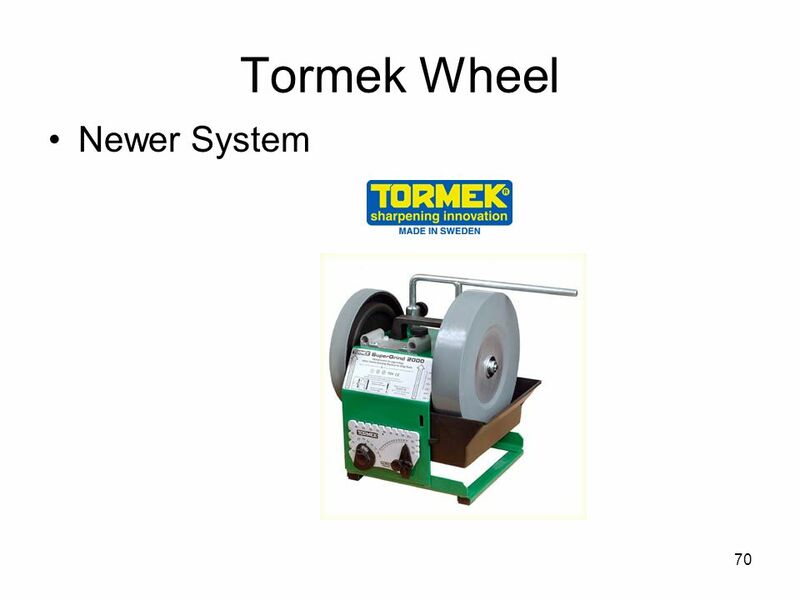 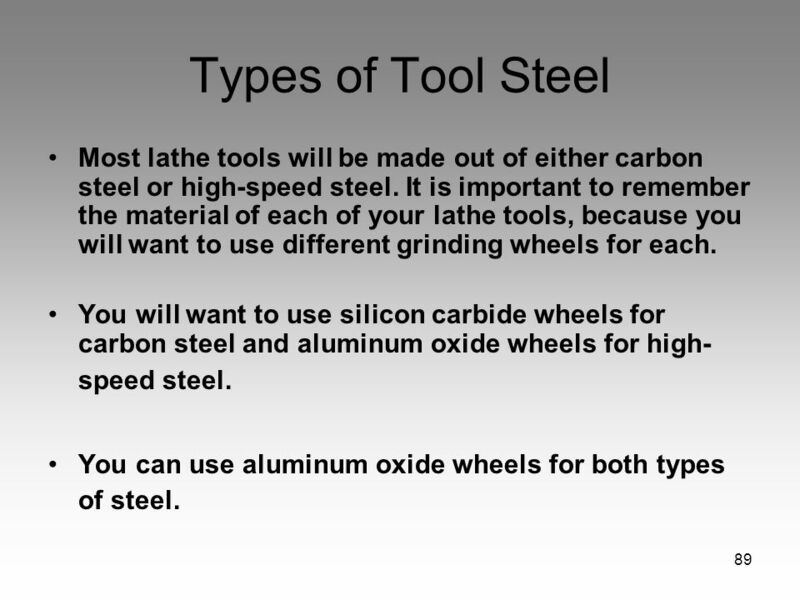 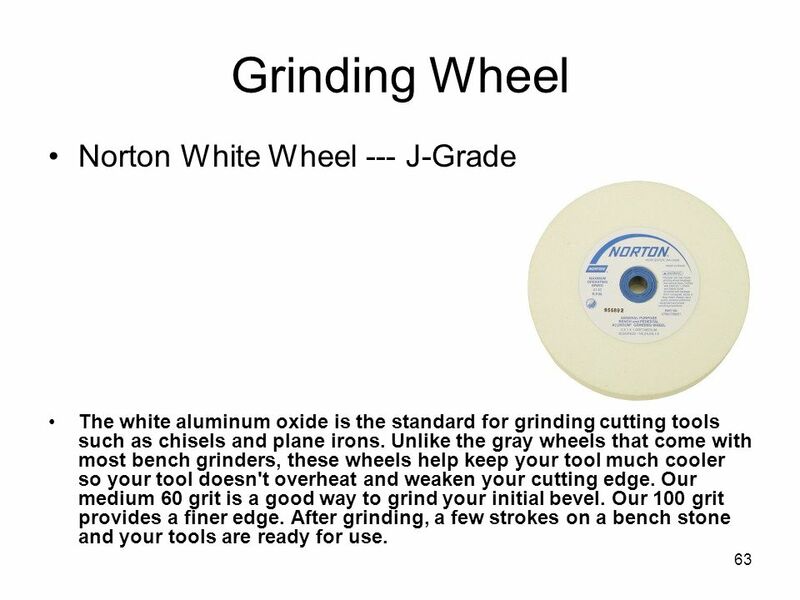 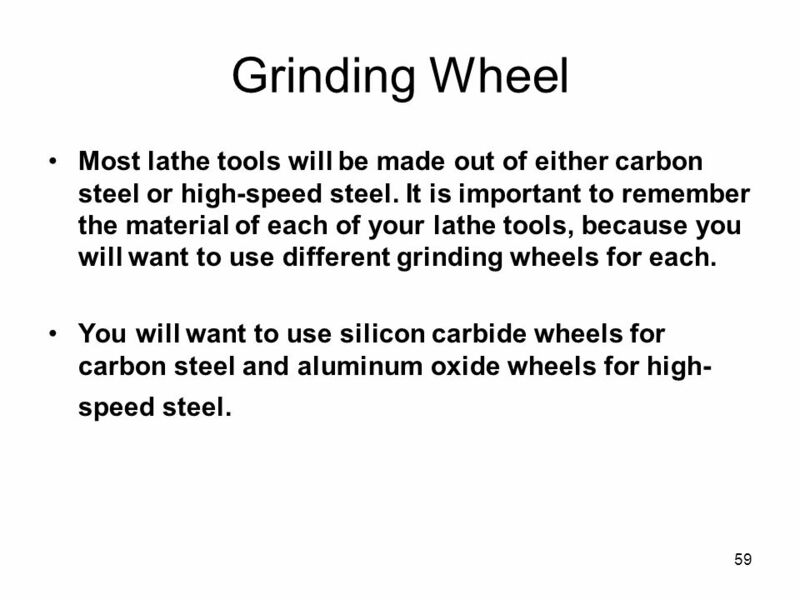 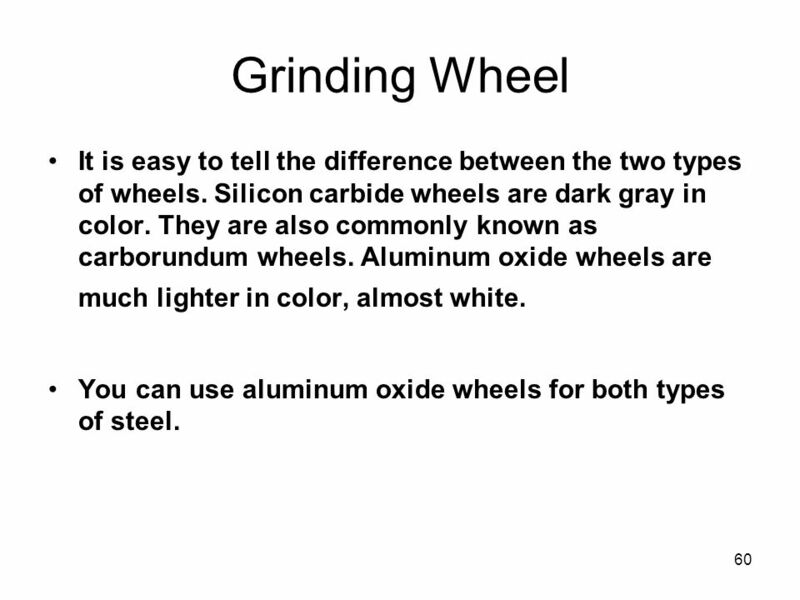 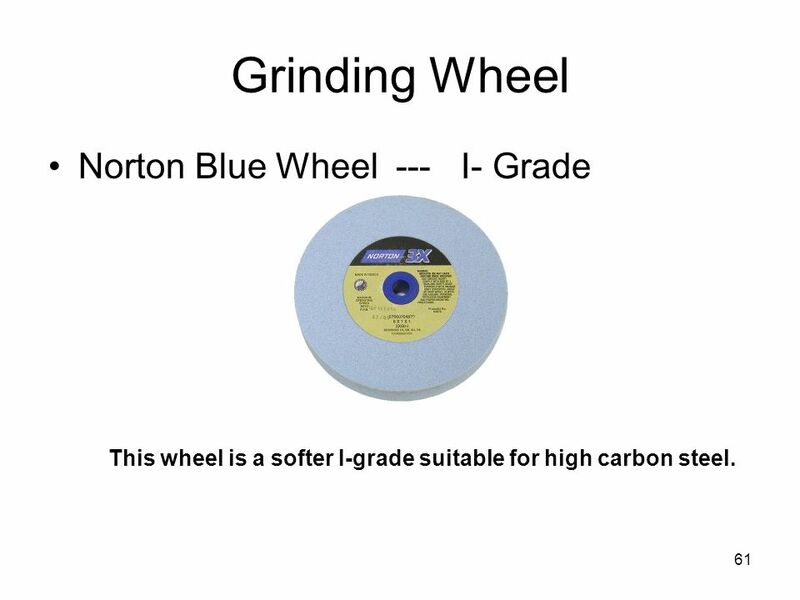 From: SharpeningSupplies.com This wheel is a softer I-grade suitable for high carbon steel. 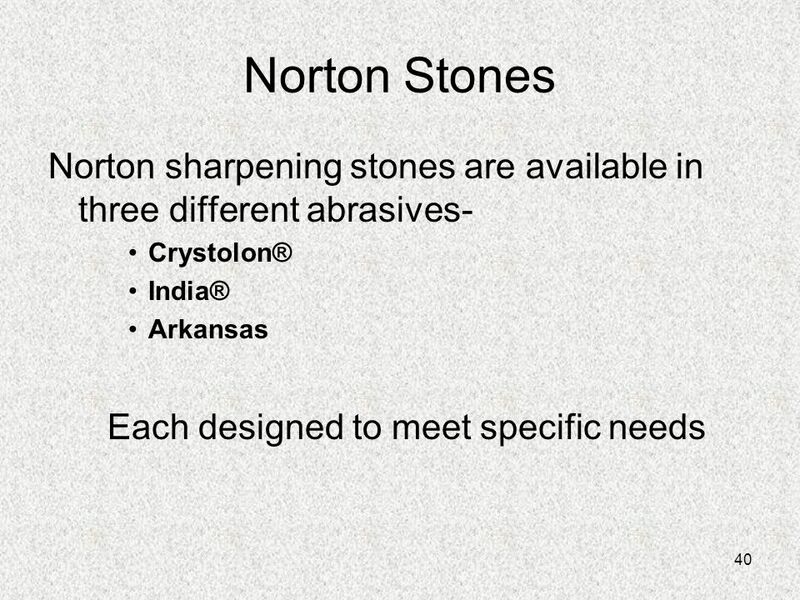 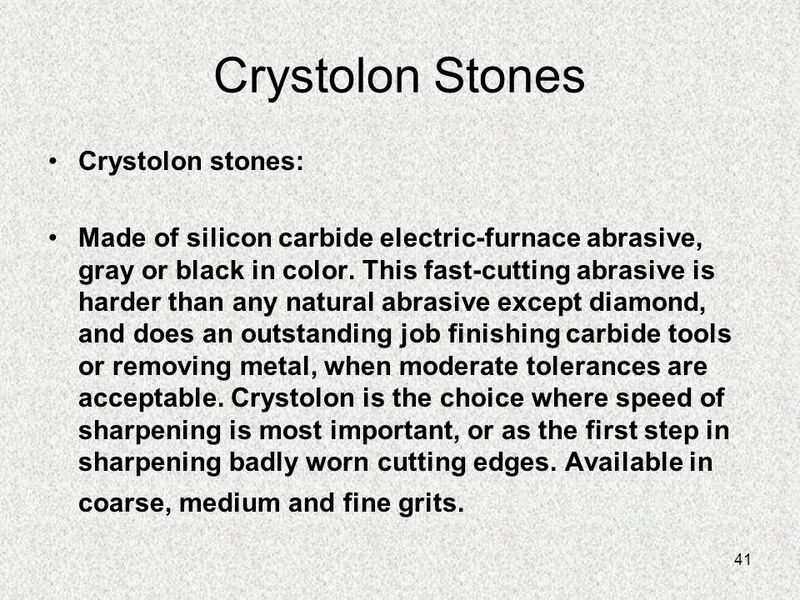 Shapton's all new ceramic on tempered glass abrasives are the perfect answer to your sharpening needs (picture and link) Shapton has pioneered a totally new concept for diamond abrasive technology. 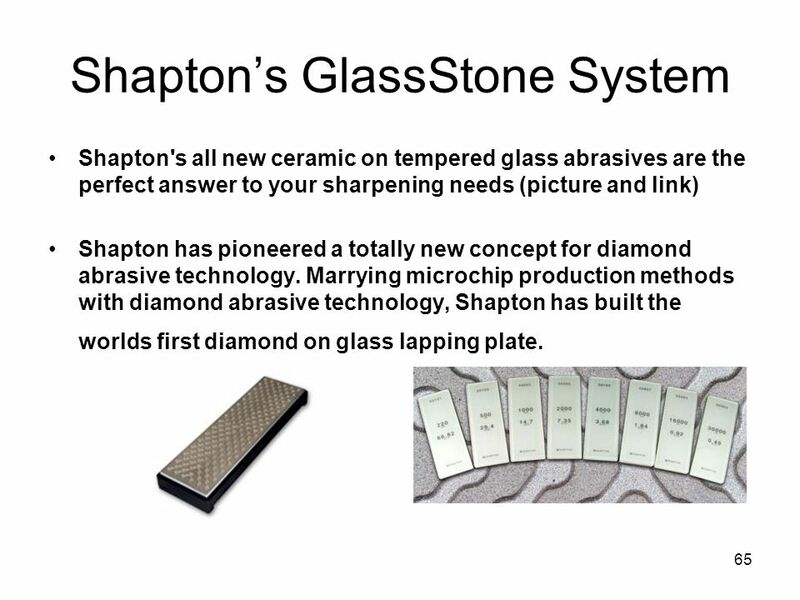 Marrying microchip production methods with diamond abrasive technology, Shapton has built the worlds first diamond on glass lapping plate. 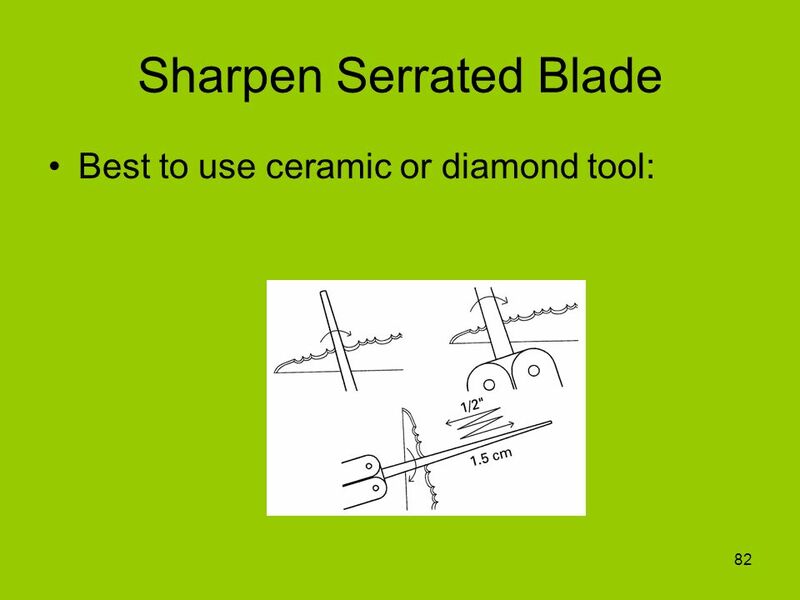 Keep diamond surface flat to the inner face of saw tooth. 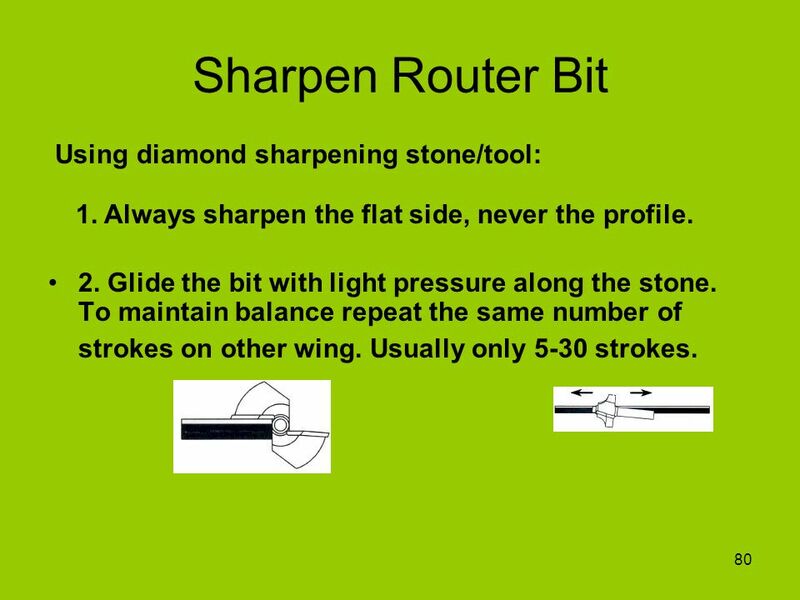 Use the same number of light, smooth, back and forth strokes on each tooth. 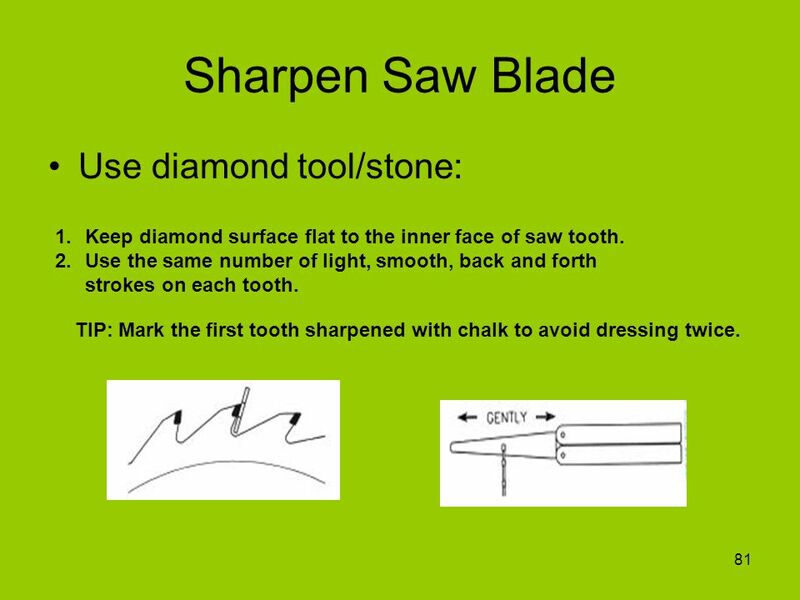 TIP: Mark the first tooth sharpened with chalk to avoid dressing twice. 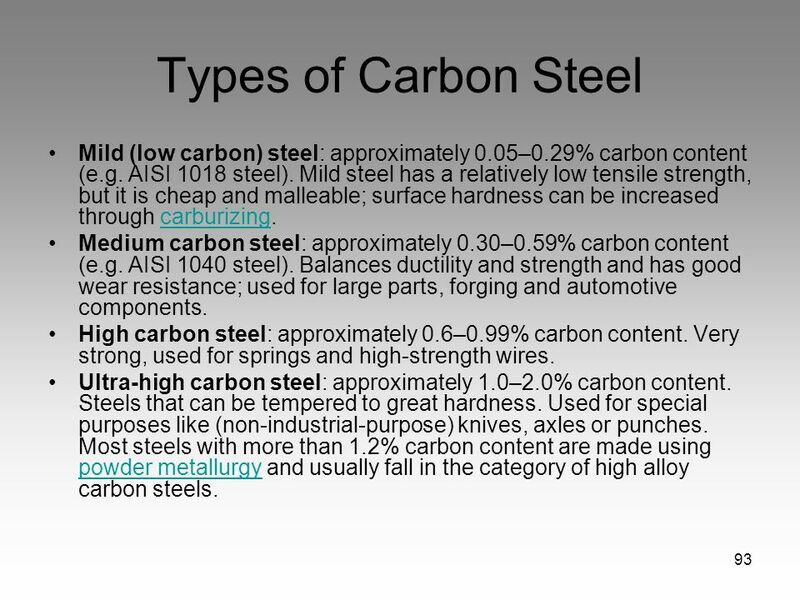 93 Types of Carbon Steel Mild (low carbon) steel: approximately 0.05–0.29% carbon content (e.g. 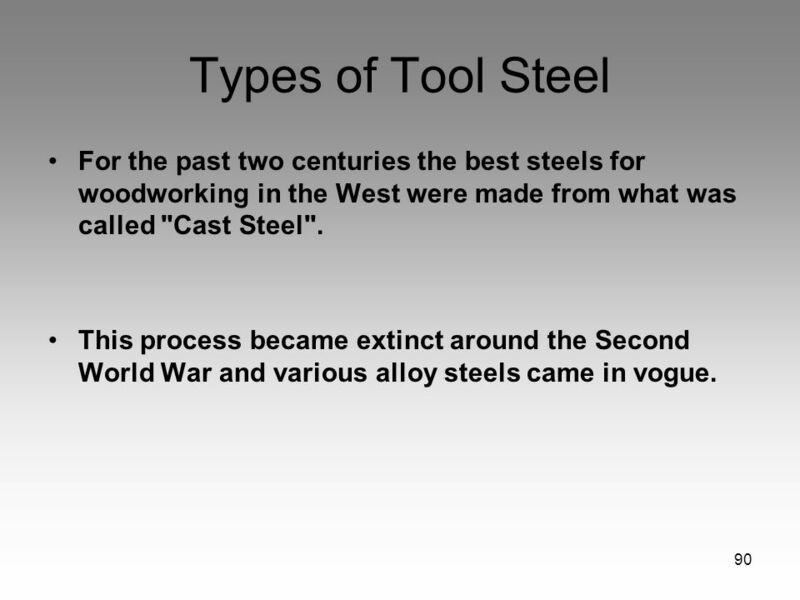 AISI 1018 steel). 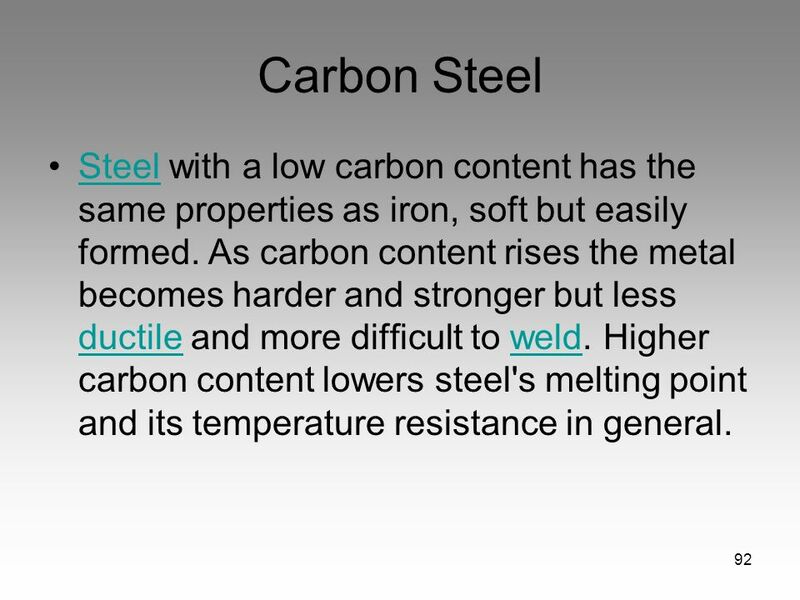 Mild steel has a relatively low tensile strength, but it is cheap and malleable; surface hardness can be increased through carburizing. 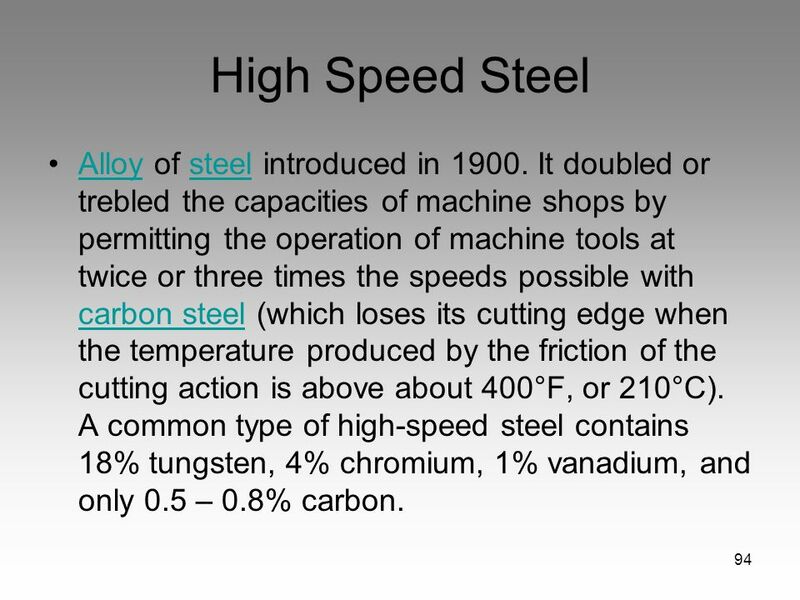 Medium carbon steel: approximately 0.30–0.59% carbon content (e.g. 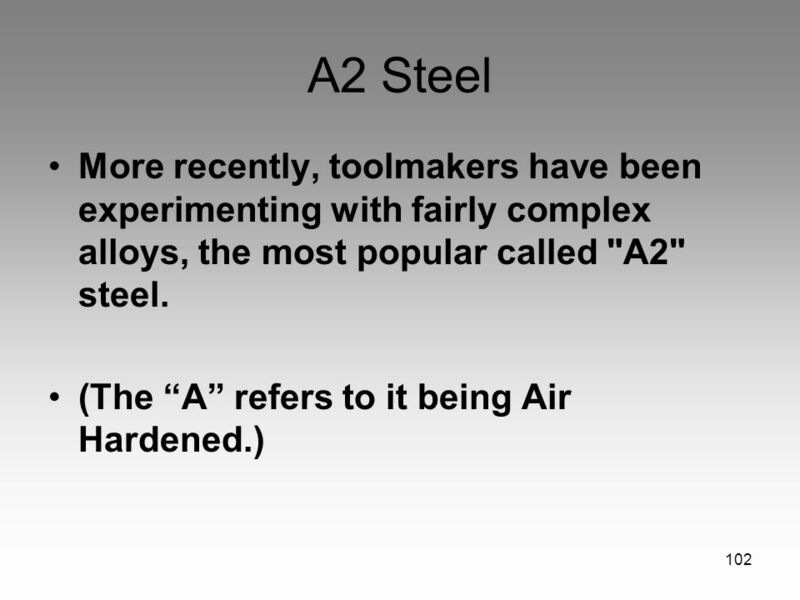 AISI 1040 steel). 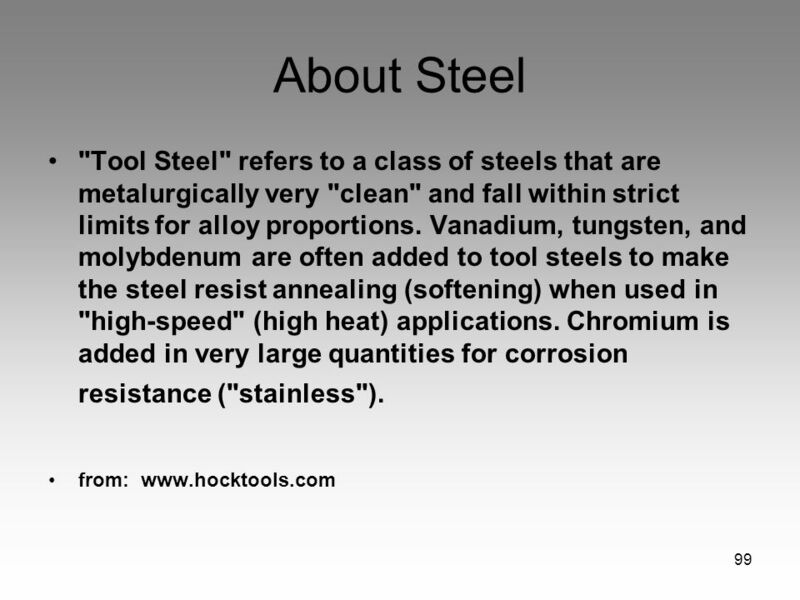 Balances ductility and strength and has good wear resistance; used for large parts, forging and automotive components. 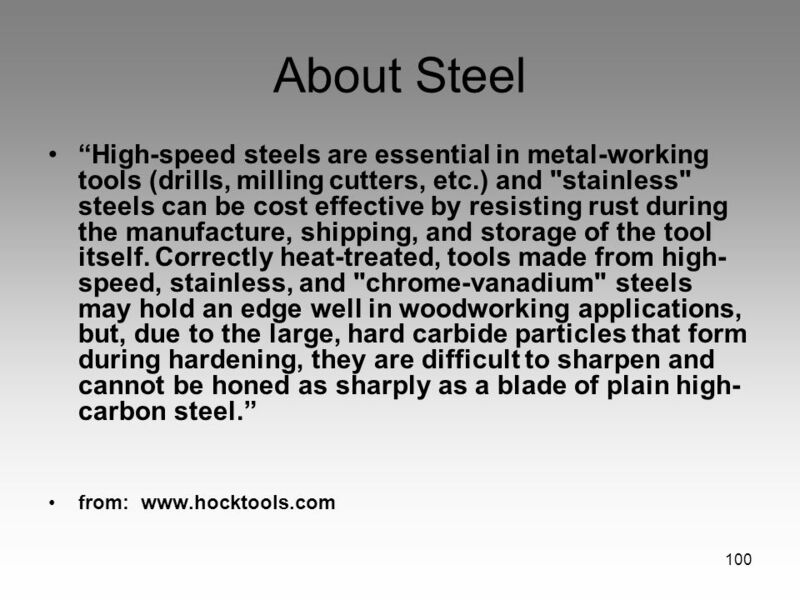 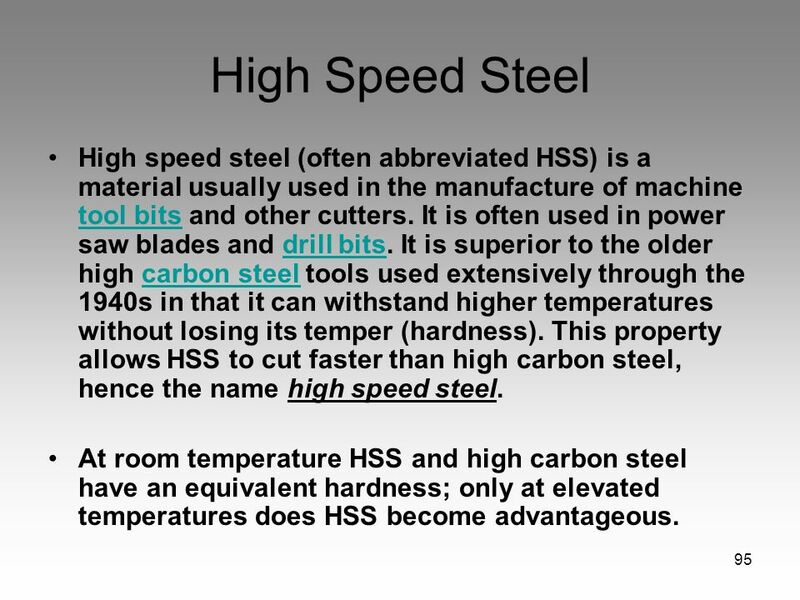 High carbon steel: approximately 0.6–0.99% carbon content. 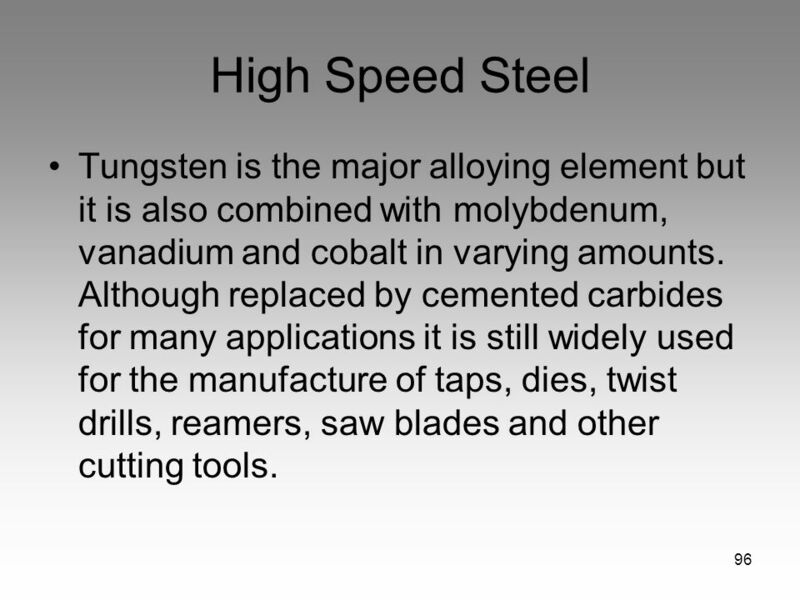 Very strong, used for springs and high-strength wires. 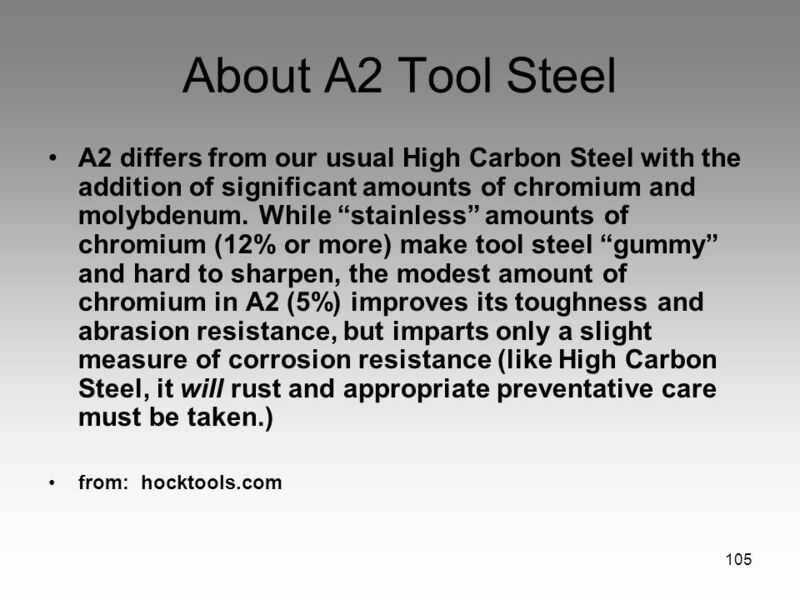 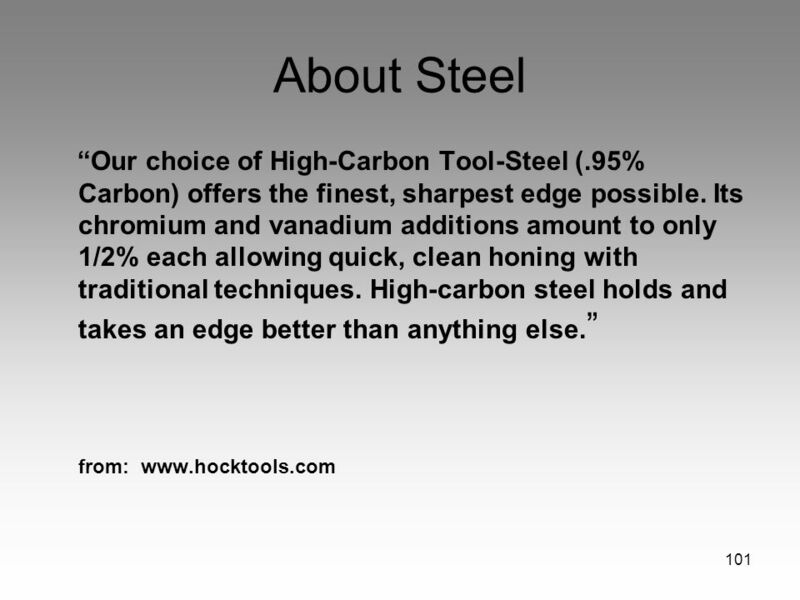 Ultra-high carbon steel: approximately 1.0–2.0% carbon content. 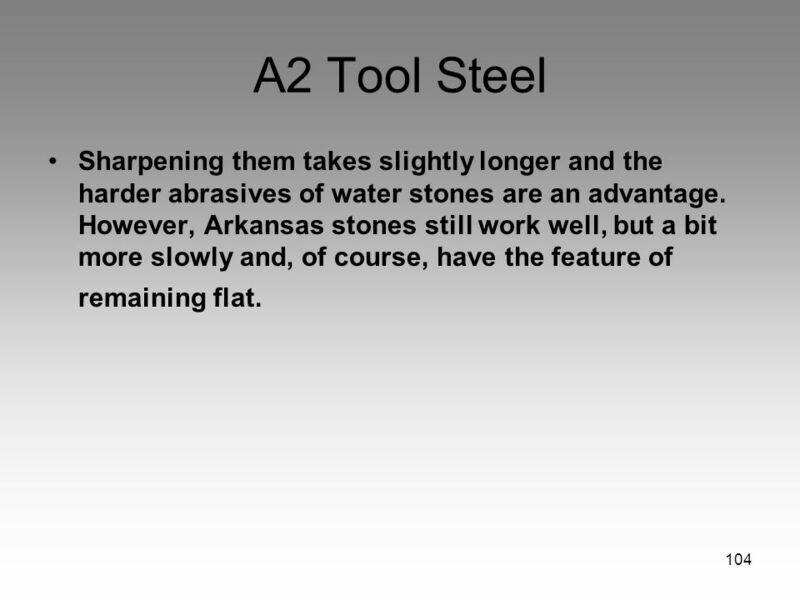 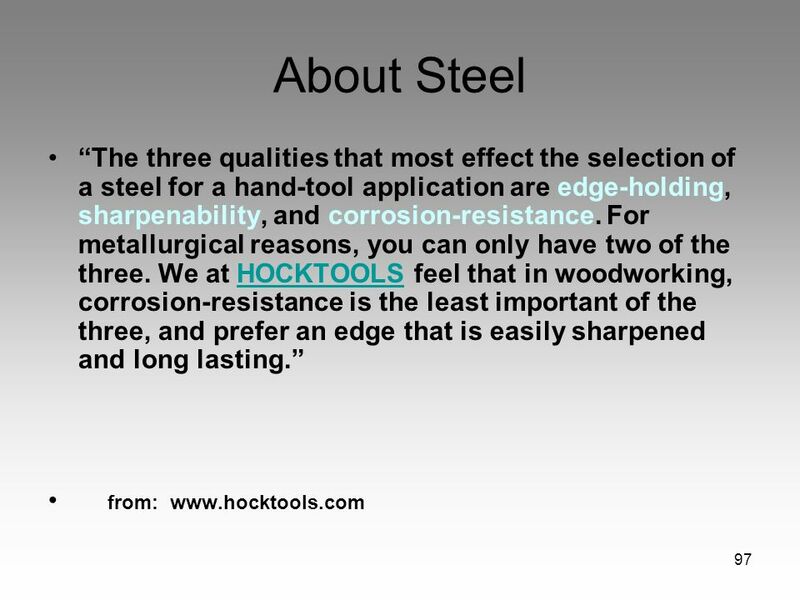 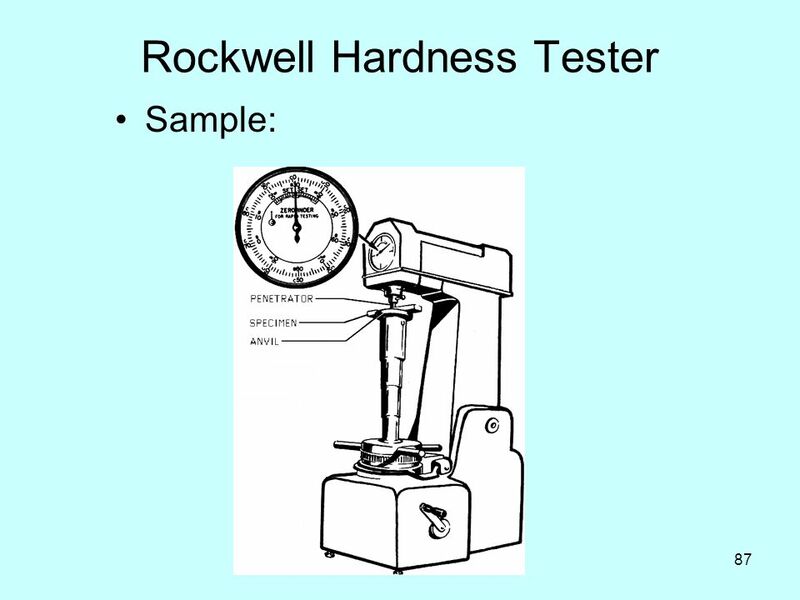 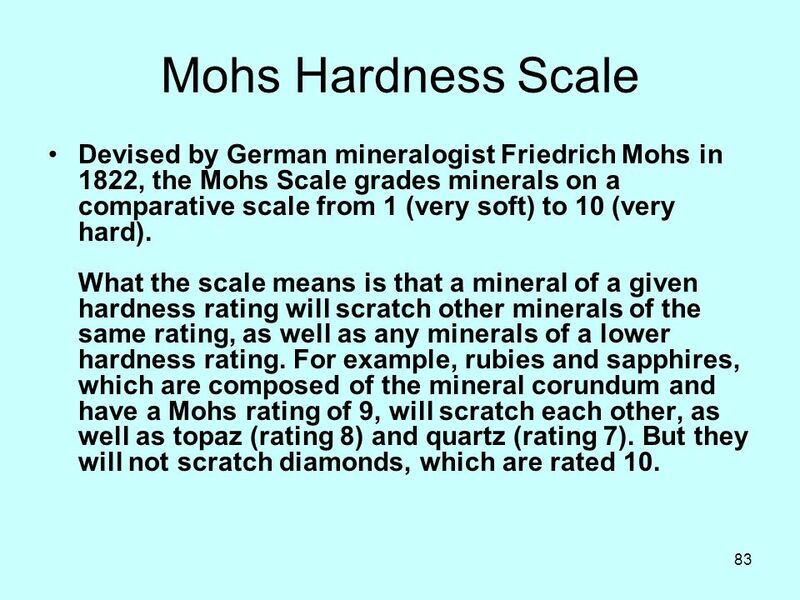 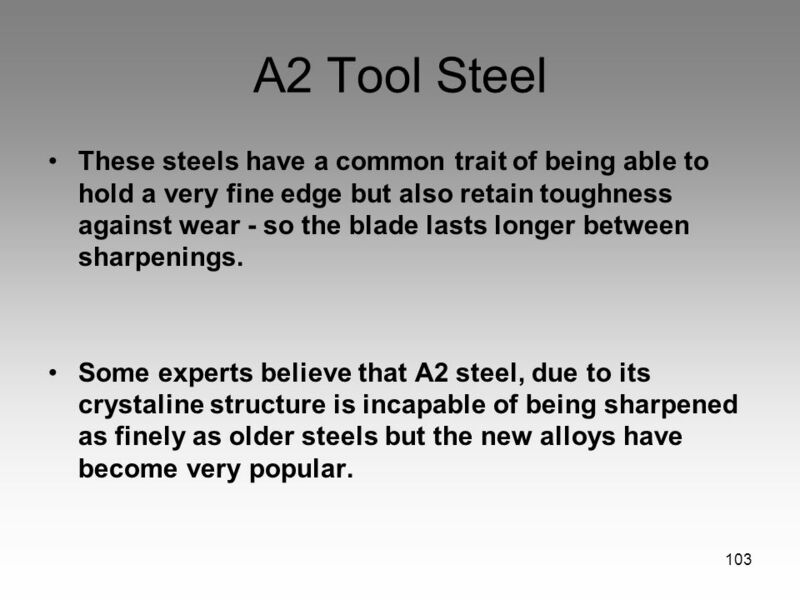 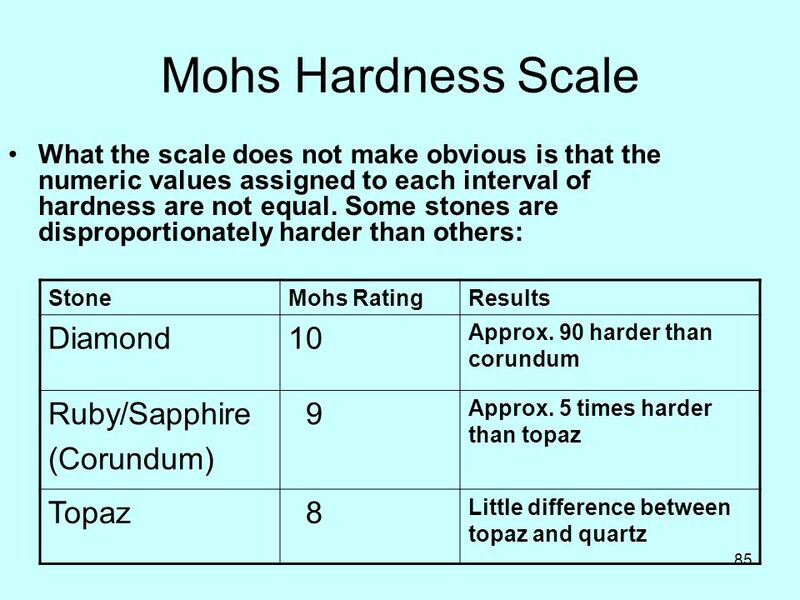 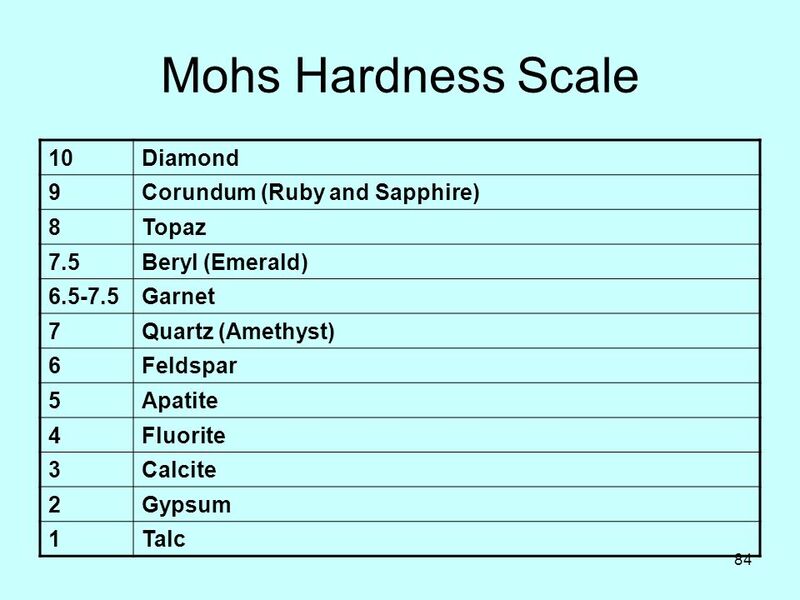 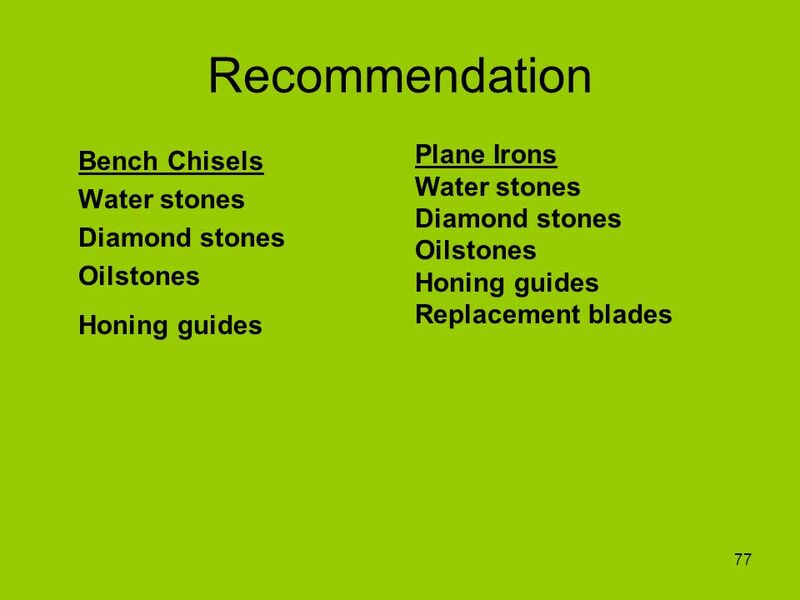 Steels that can be tempered to great hardness. 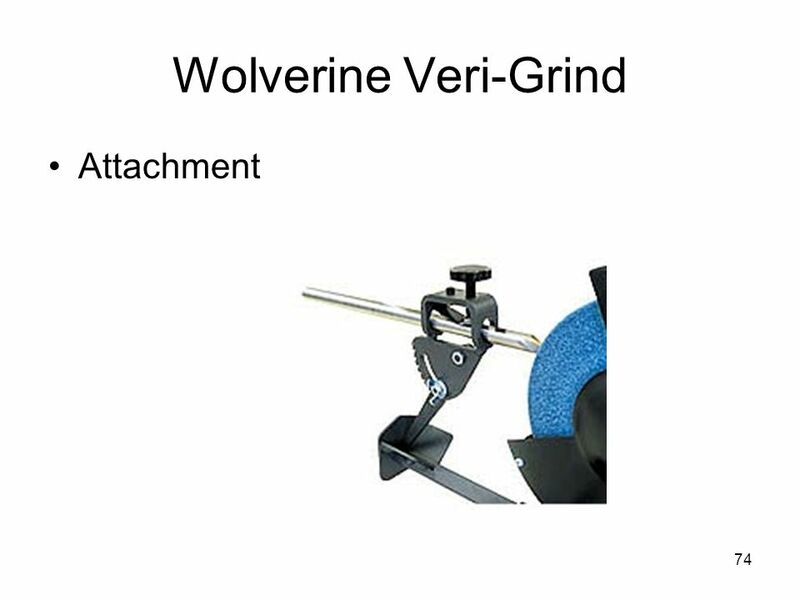 Used for special purposes like (non-industrial-purpose) knives, axles or punches. 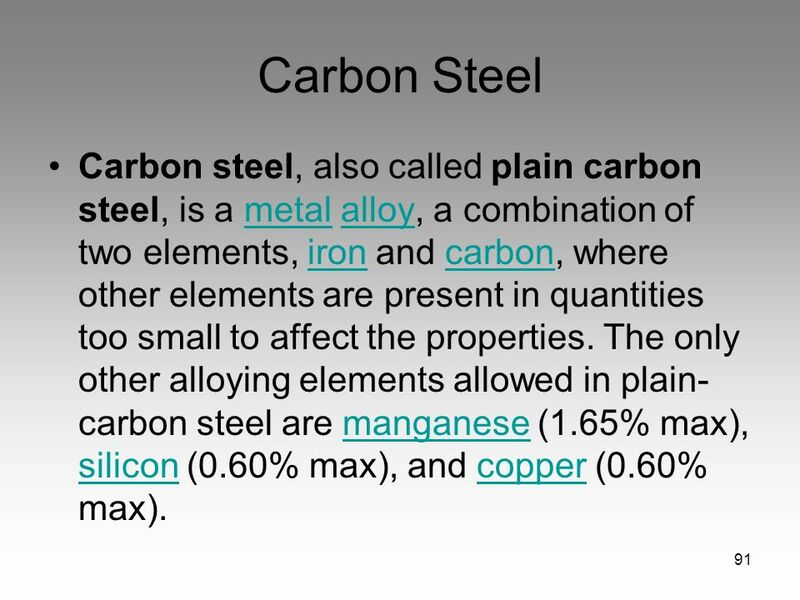 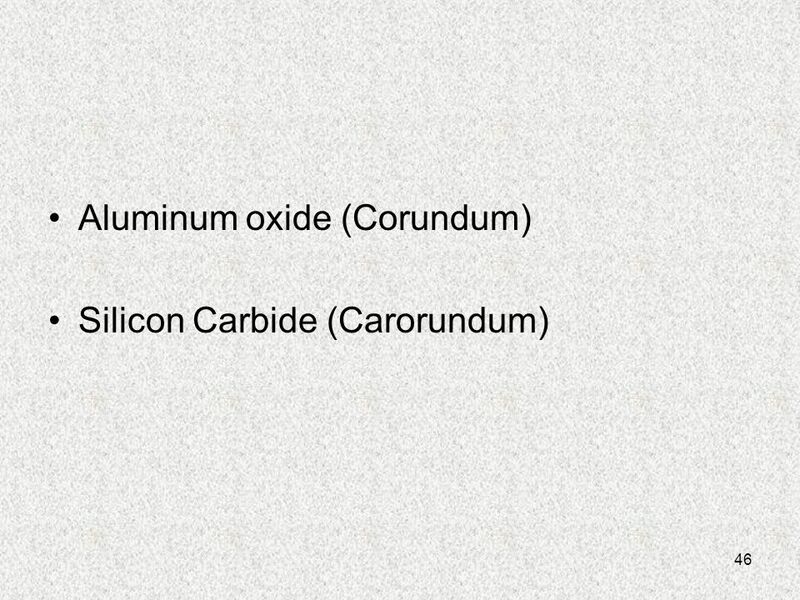 Most steels with more than 1.2% carbon content are made using powder metallurgy and usually fall in the category of high alloy carbon steels. 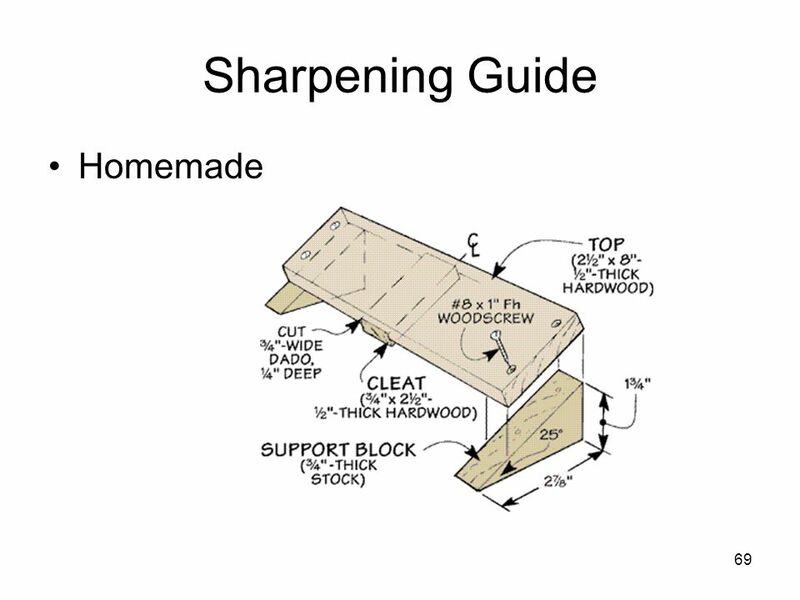 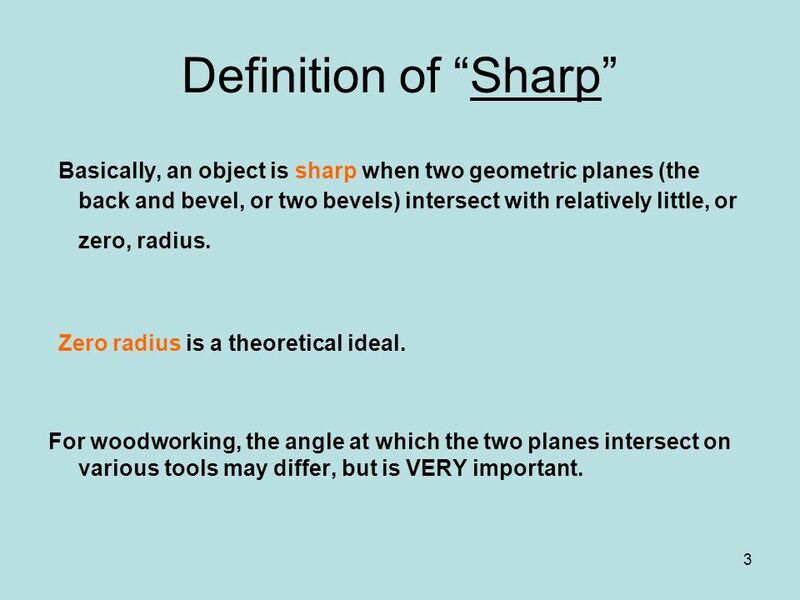 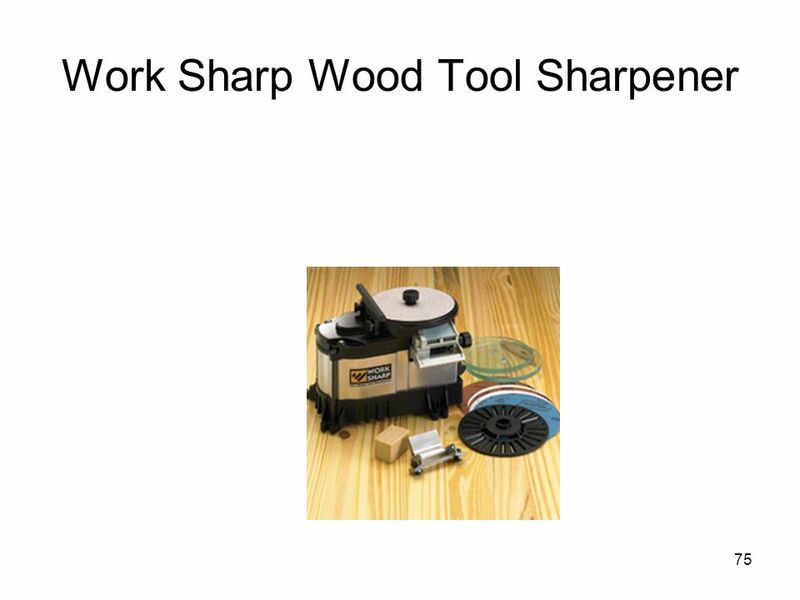 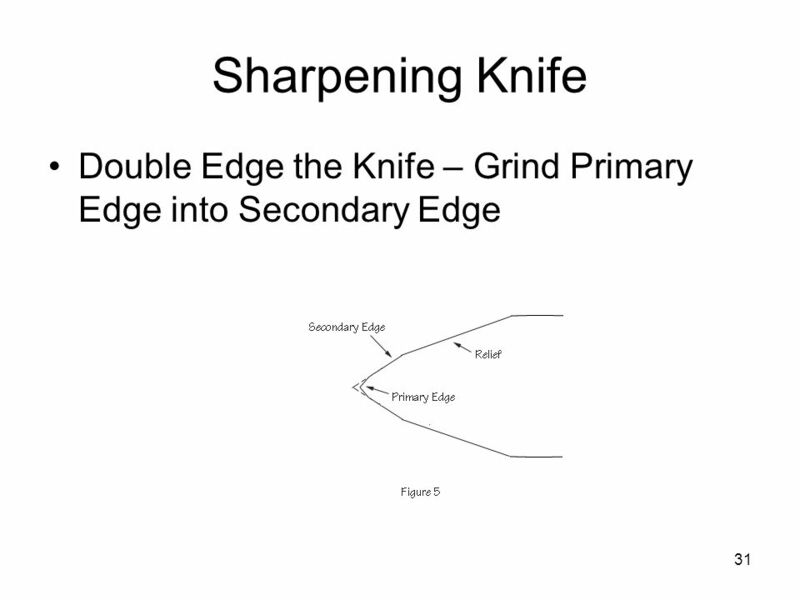 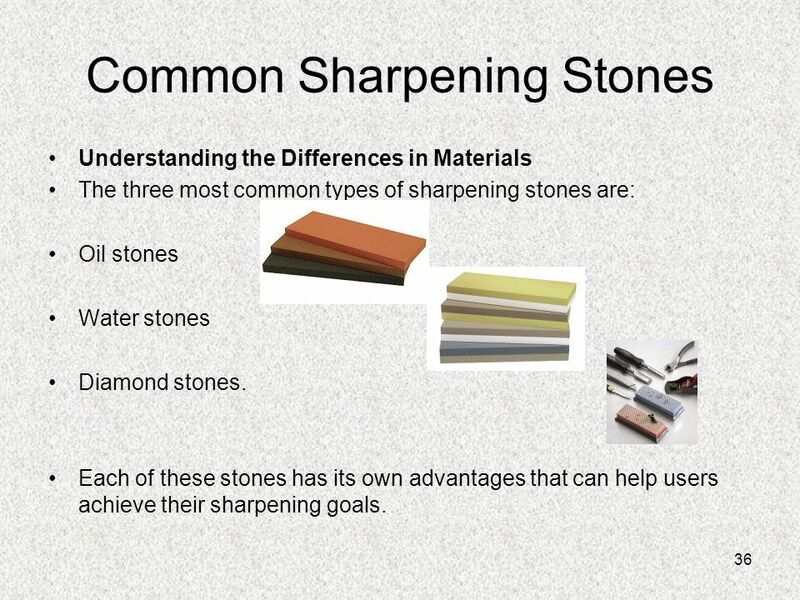 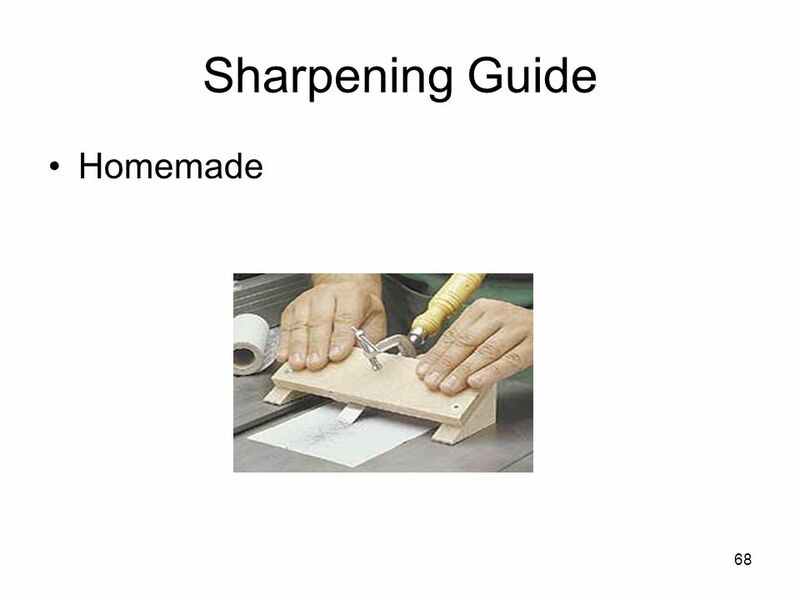 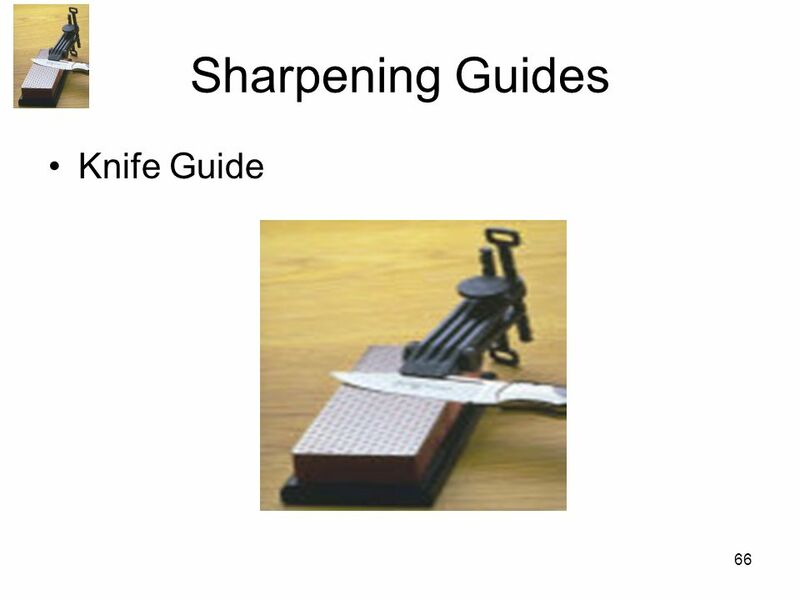 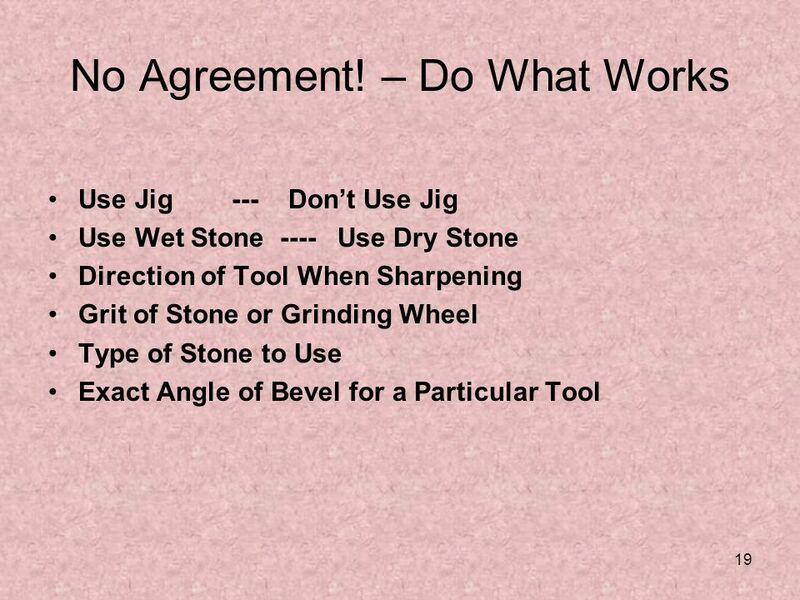 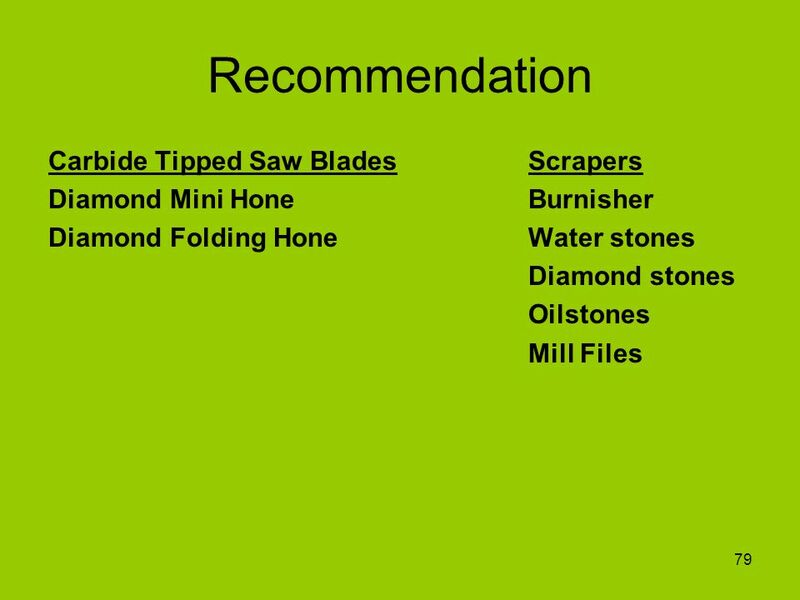 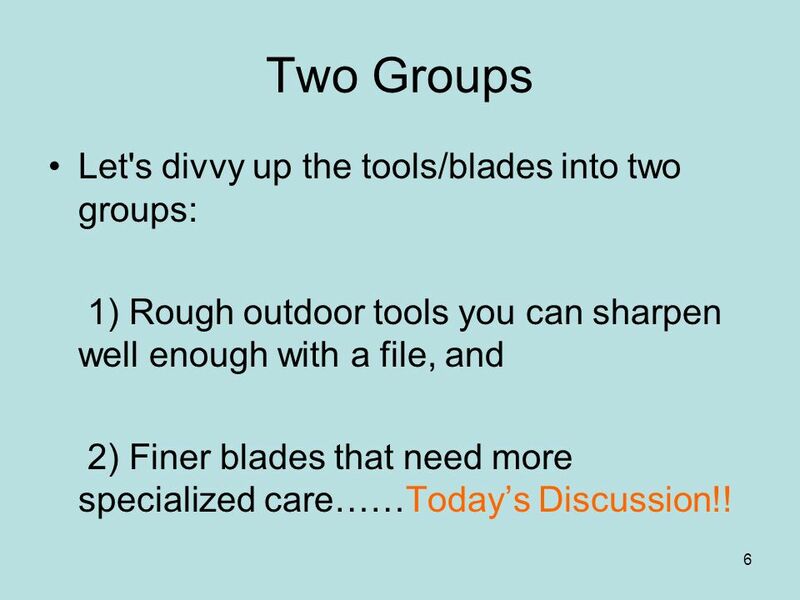 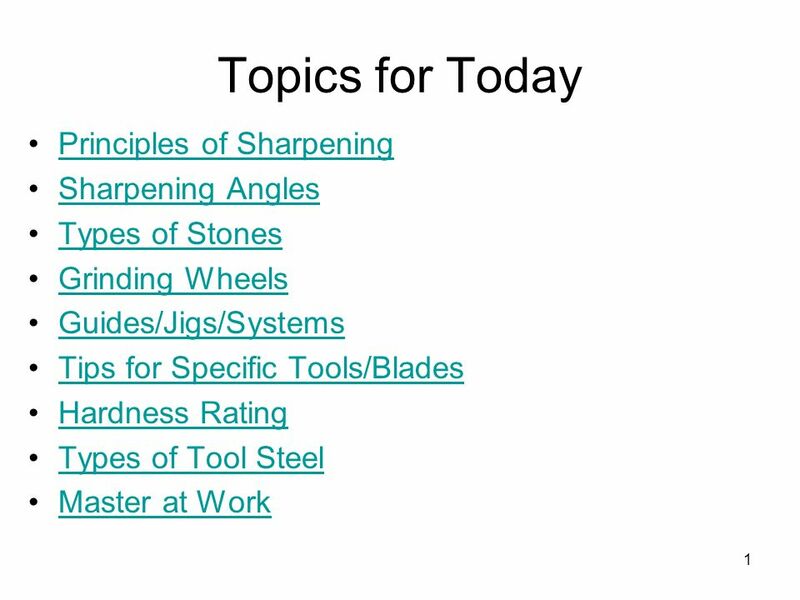 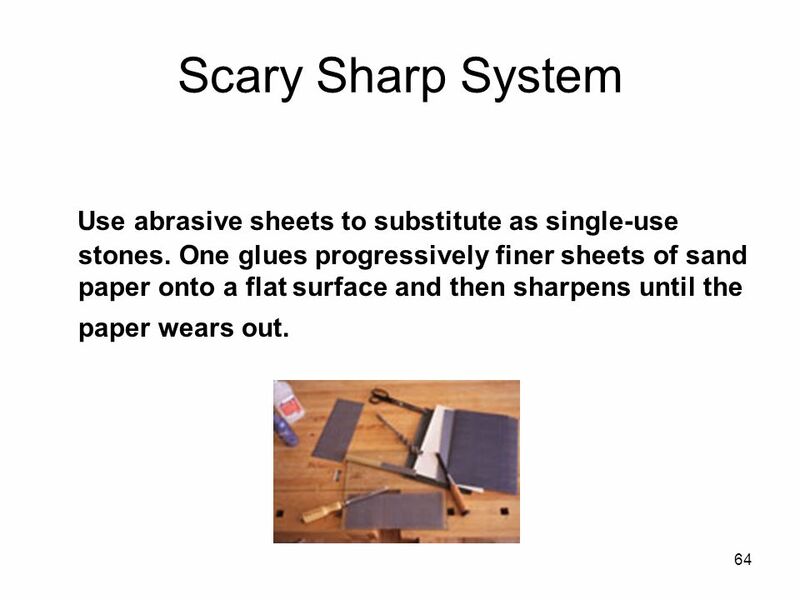 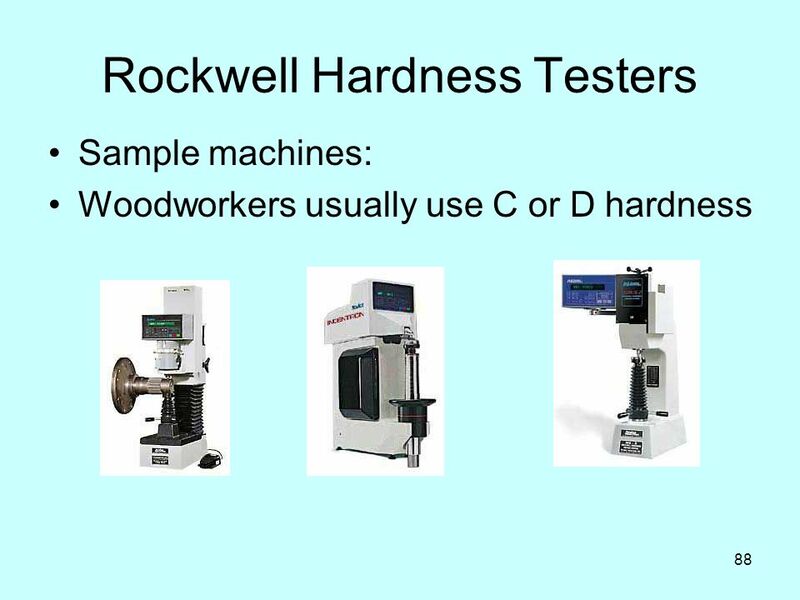 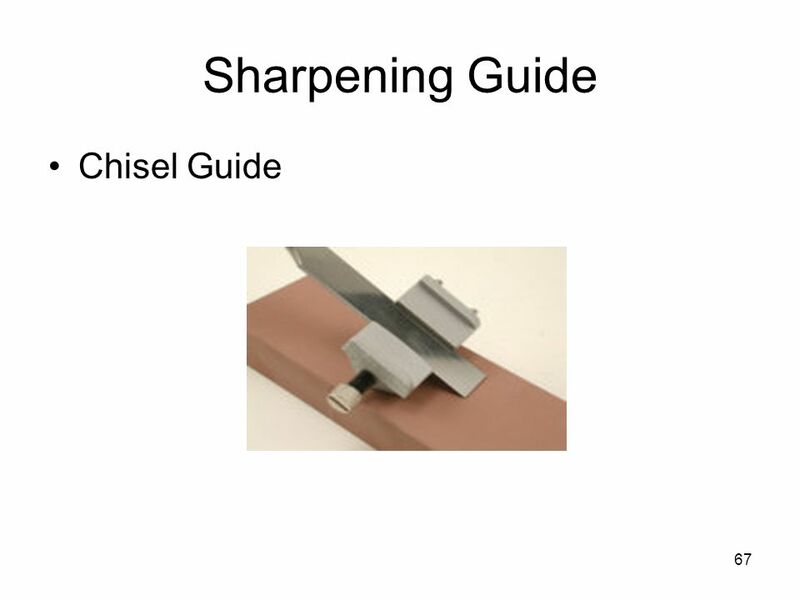 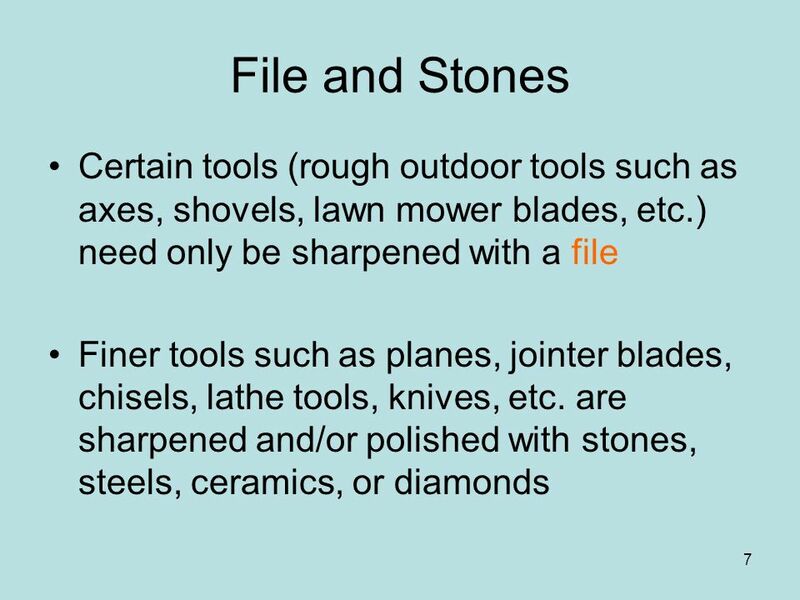 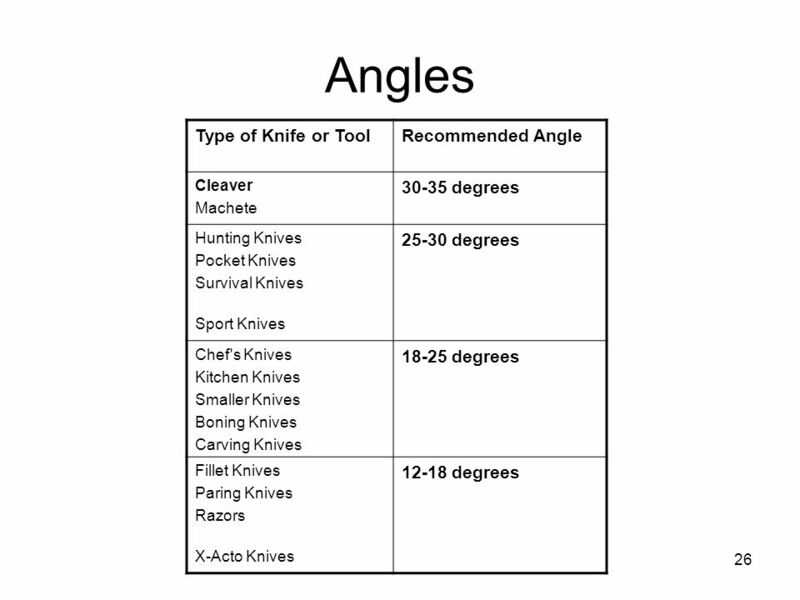 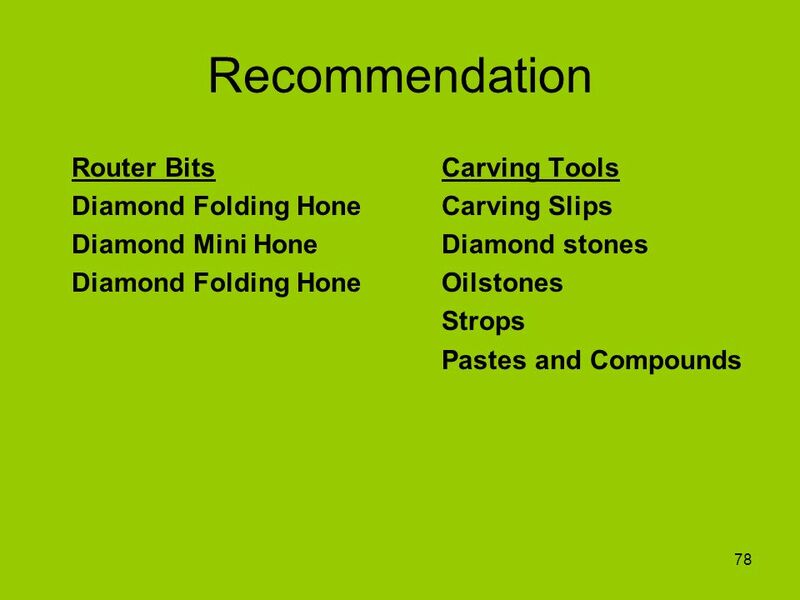 Download ppt "Topics for Today Principles of Sharpening Sharpening Angles"
EBB440 Applied Metallurgy Abrasive Machining.